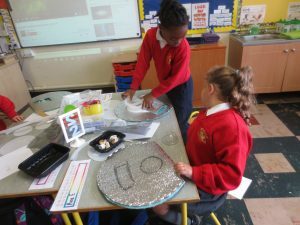 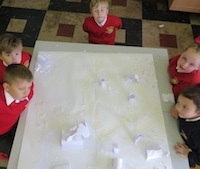 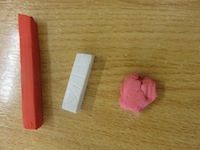 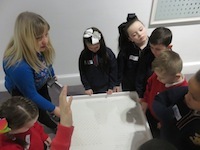 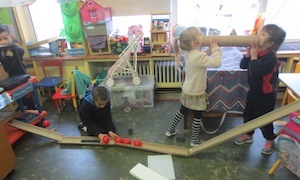 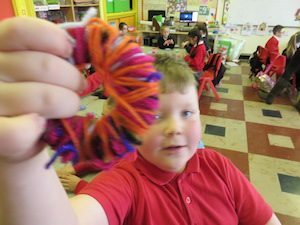 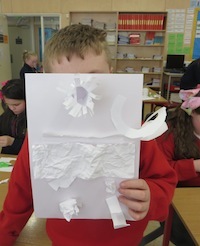 Second class were exploring space and planets when I began working with them every Monday morning in September. 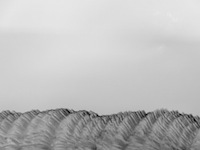 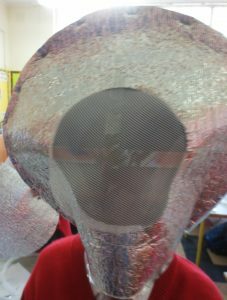 I thought that it might be good to have space helmets for their exploration. 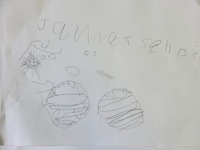 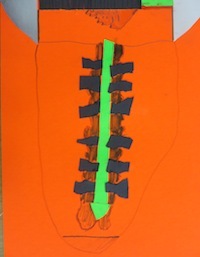 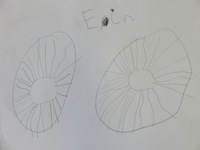 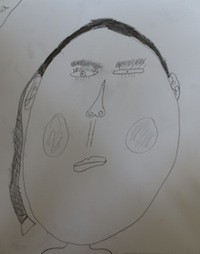 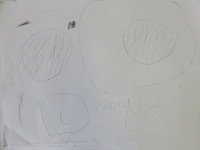 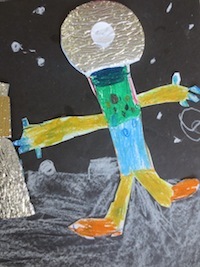 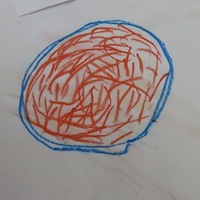 They began by drawing self-portraits so we could use these drawings as a base for our space helmet design. 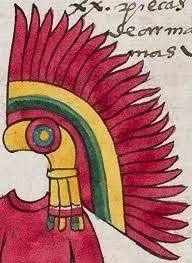 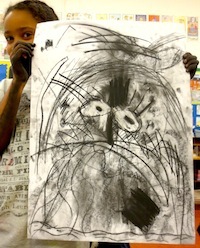 They designed their helmets by making charcoal drawings on transparent paper over their portraits. 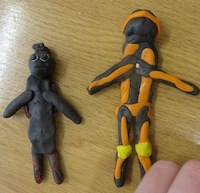 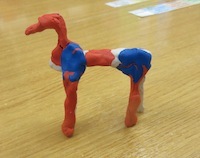 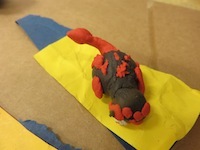 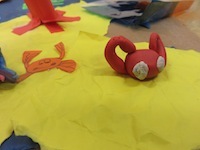 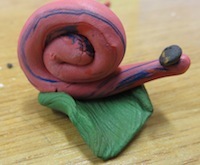 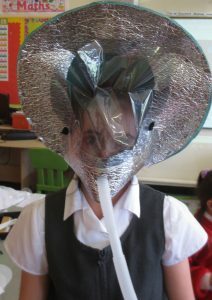 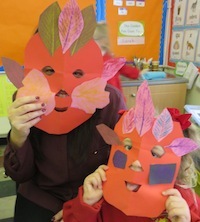 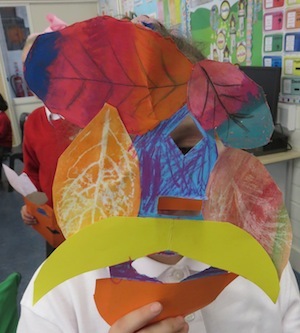 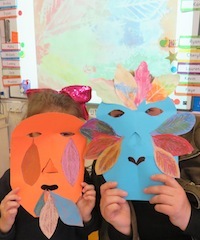 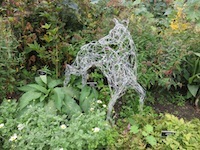 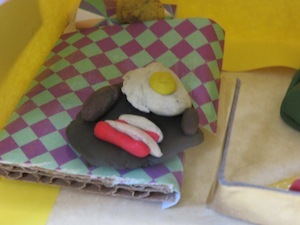 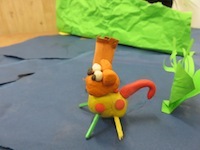 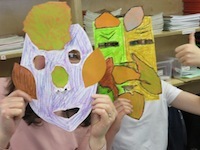 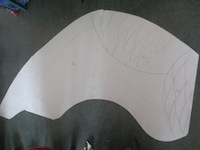 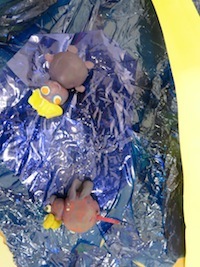 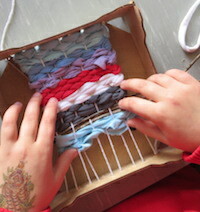 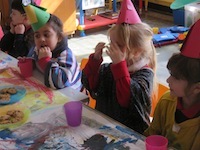 As they were designing them they discussed how they would eat, breathe and communicate in them. 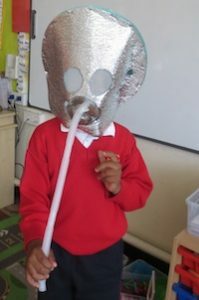 Using silver space material they made their helmets. 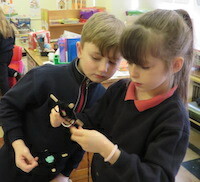 They put in lots of buttons that had many functions. 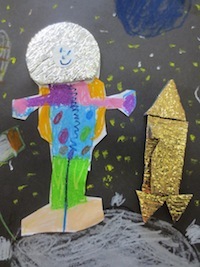 When their helmets were finished they put them on and sent each other space messages. 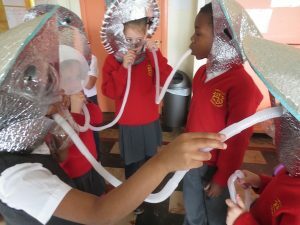 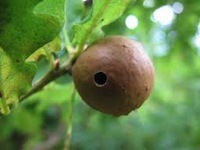 Someone whispered a space message to the next person in the circle using their speaking tubes and then they passed it on, (like Chinese whispers) but theirs were space whispers. 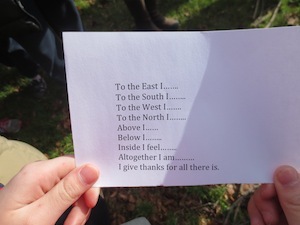 At the end each person had to write down what they heard. 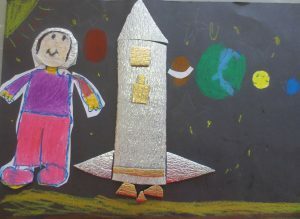 They made collage about their space travel in their helmets. 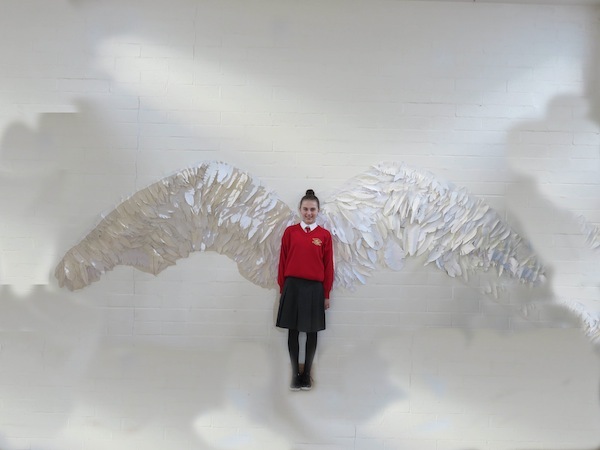 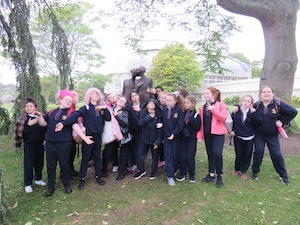 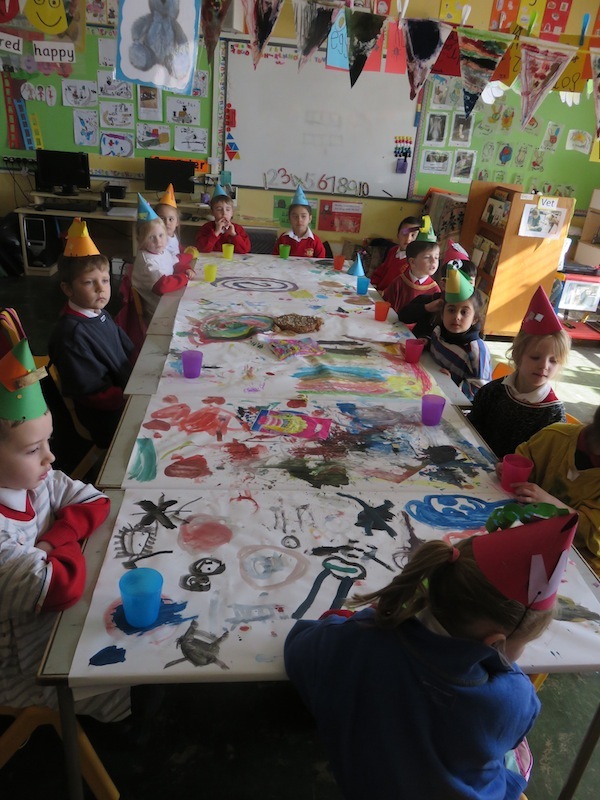 Fourth Class, Loreto Senior Crumlin. 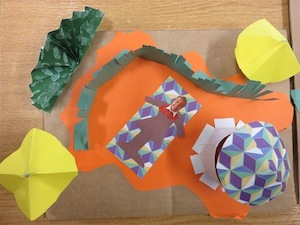 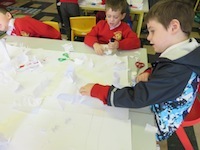 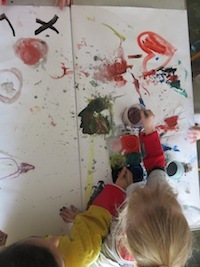 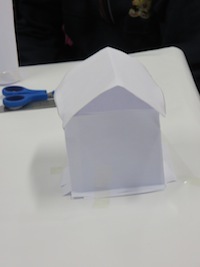 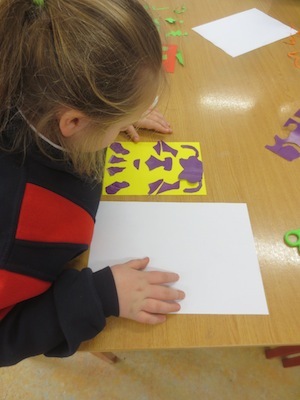 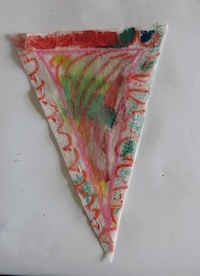 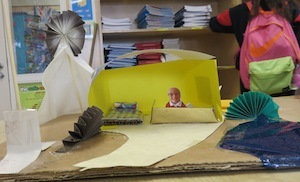 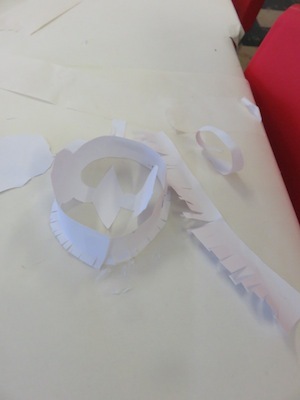 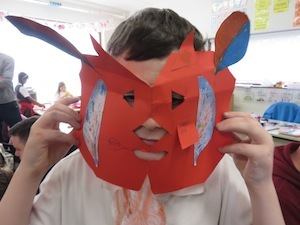 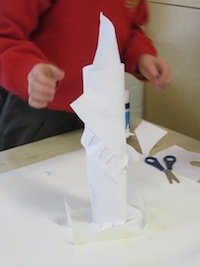 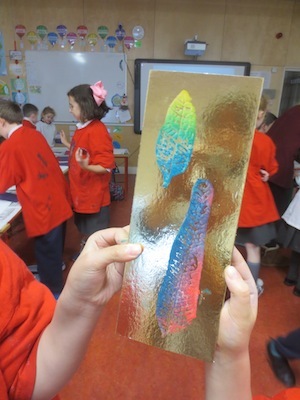 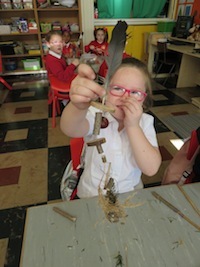 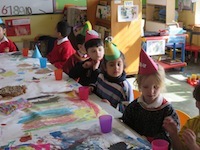 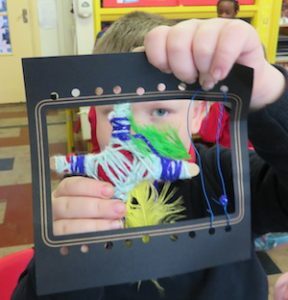 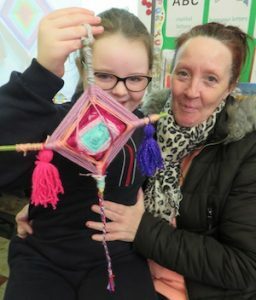 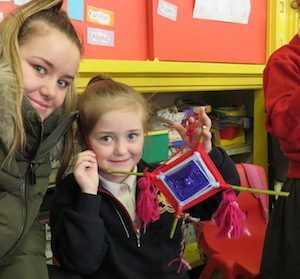 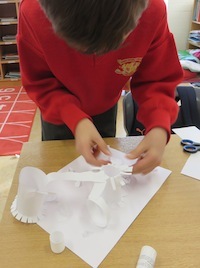 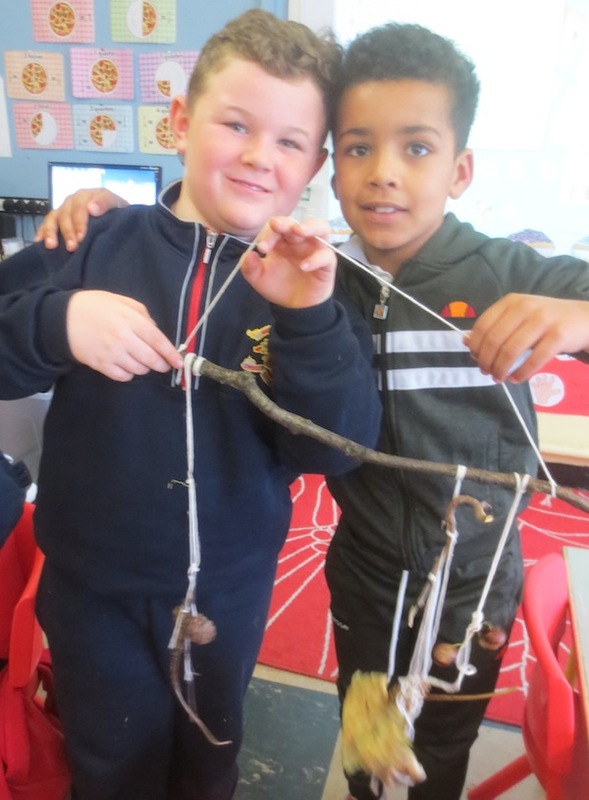 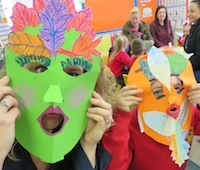 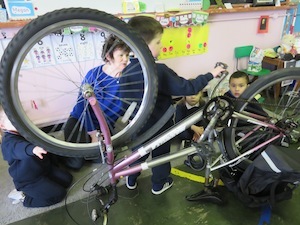 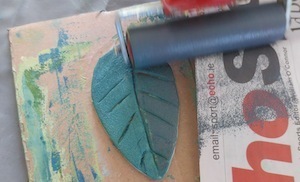 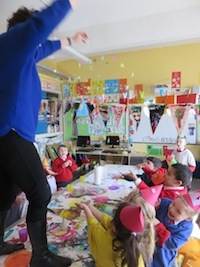 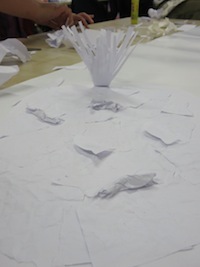 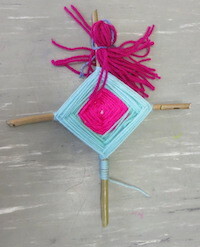 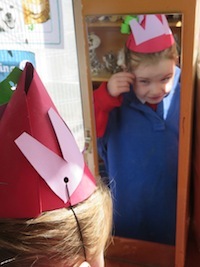 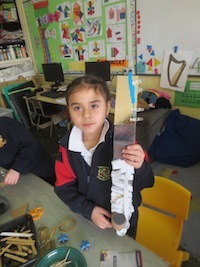 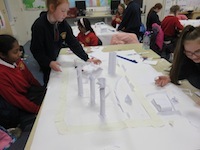 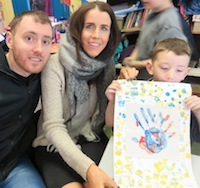 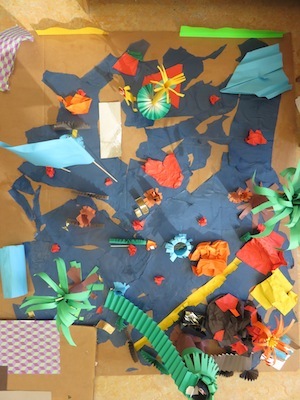 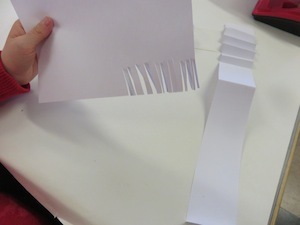 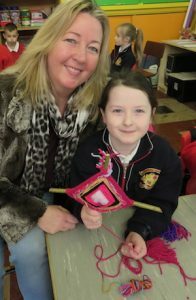 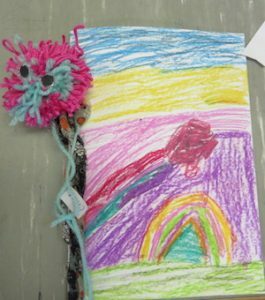 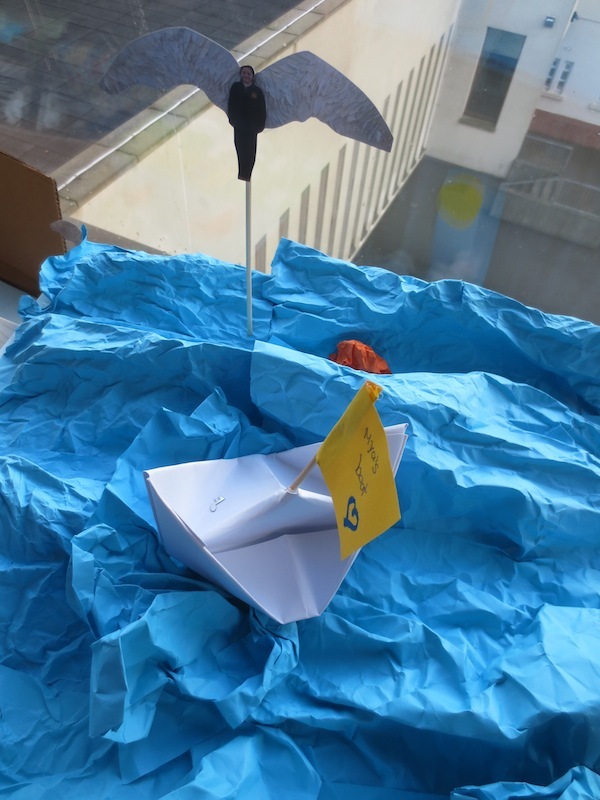 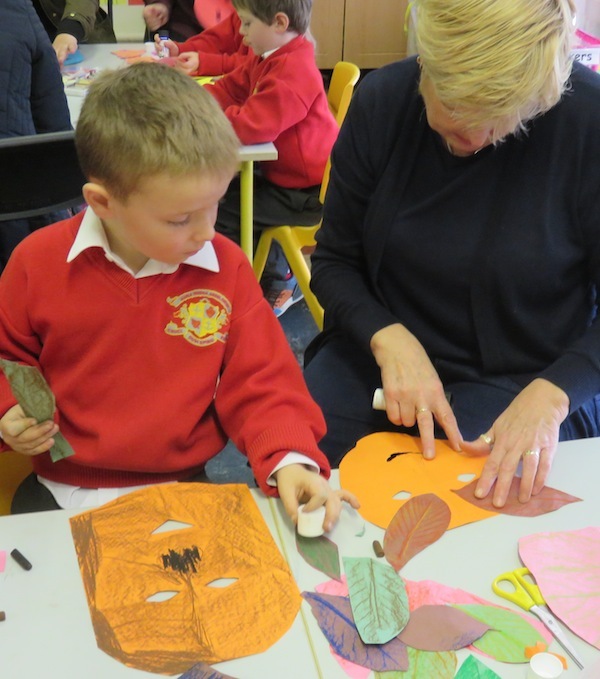 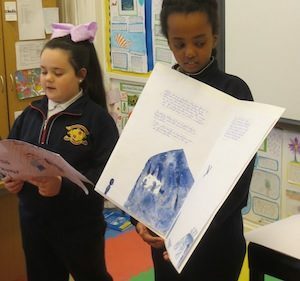 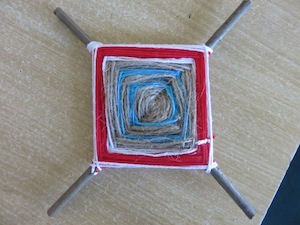 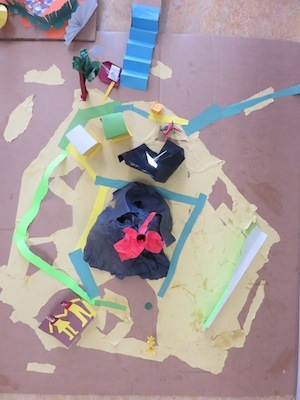 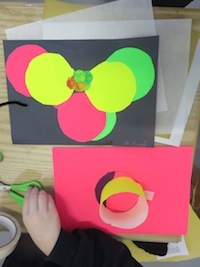 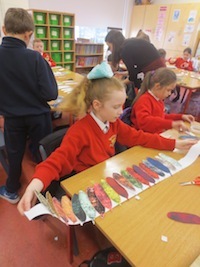 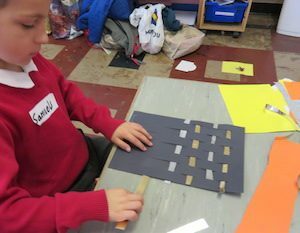 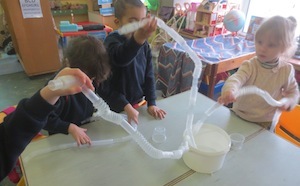 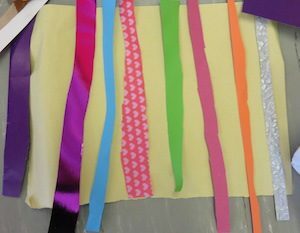 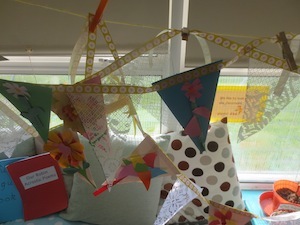 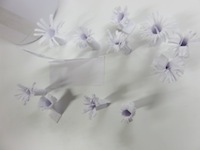 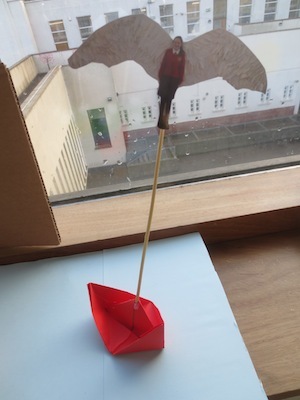 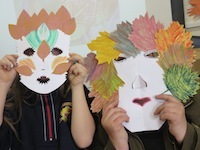 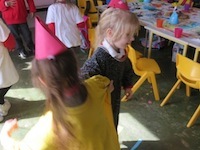 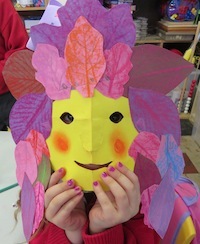 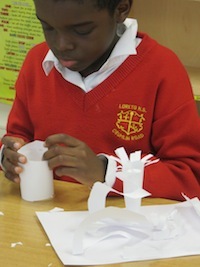 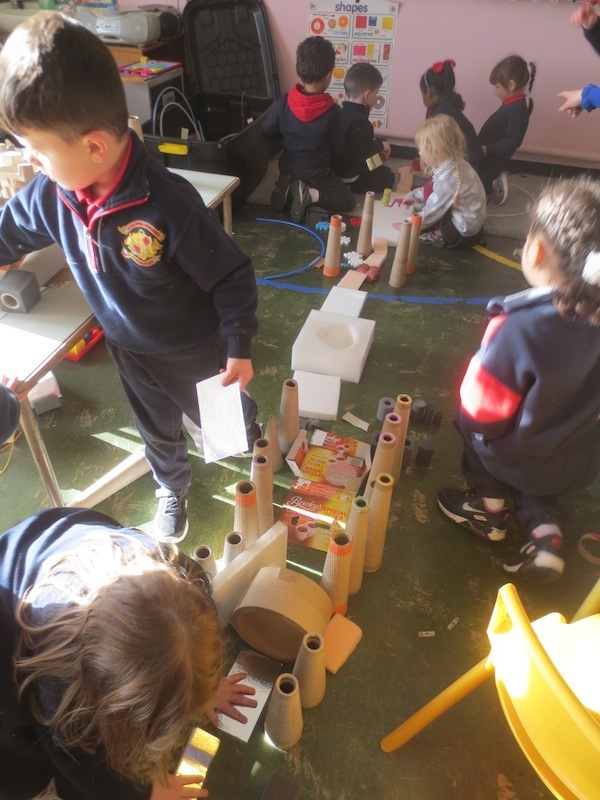 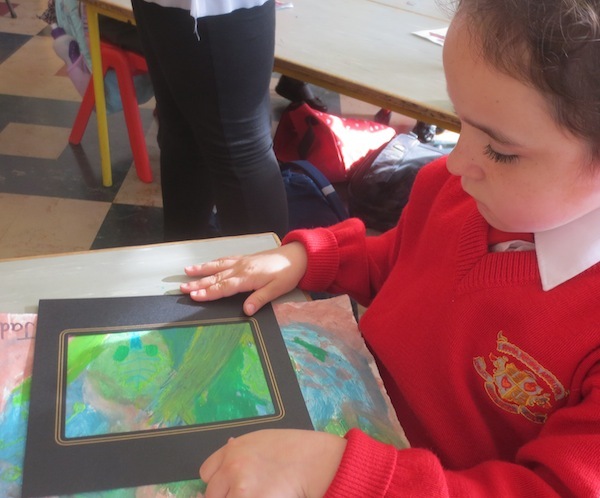 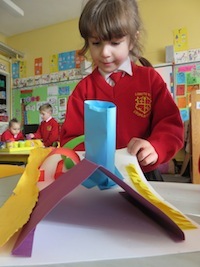 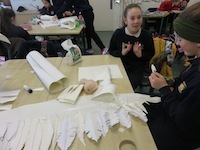 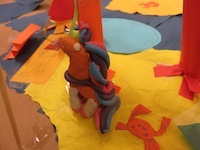 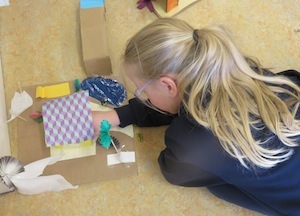 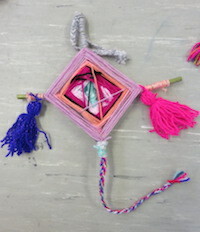 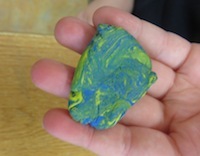 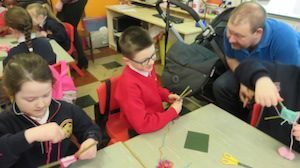 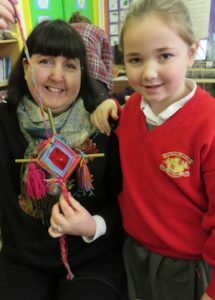 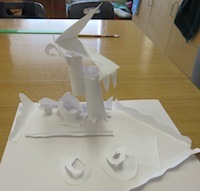 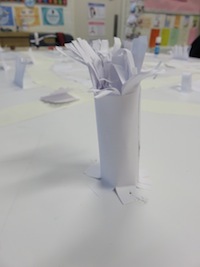 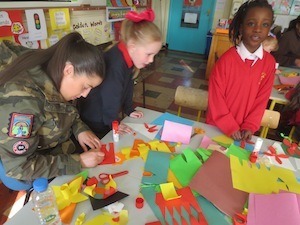 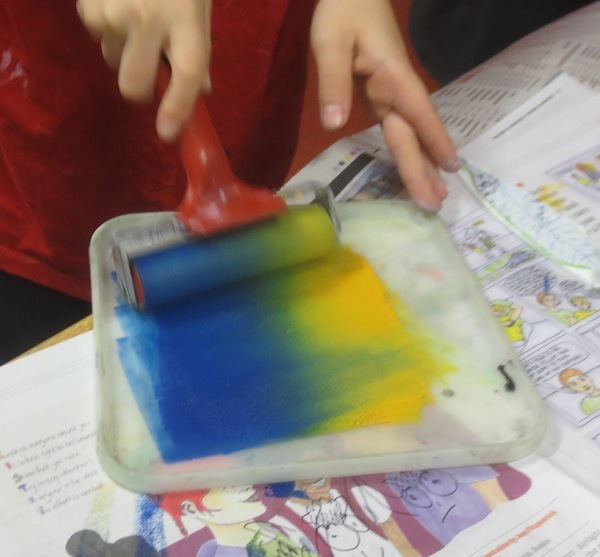 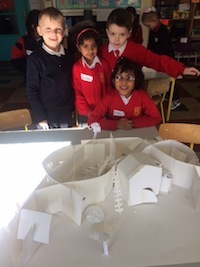 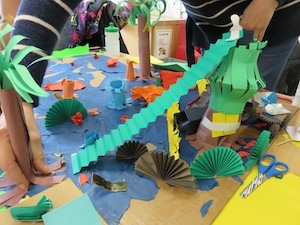 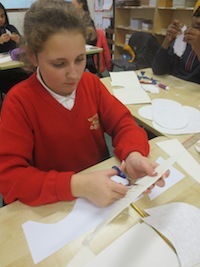 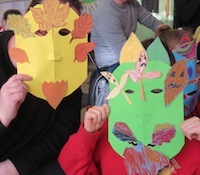 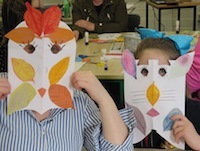 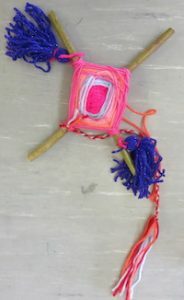 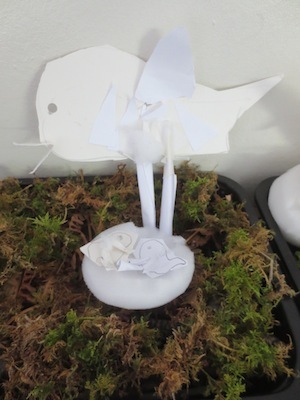 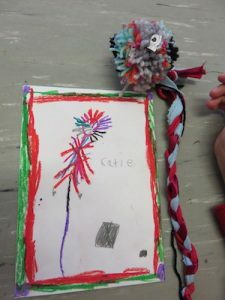 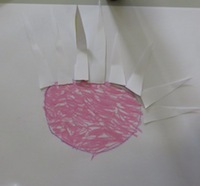 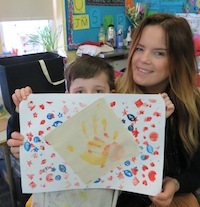 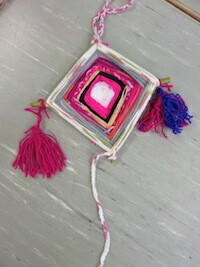 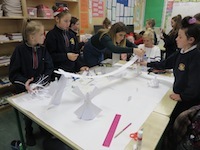 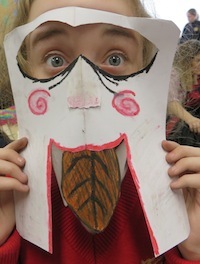 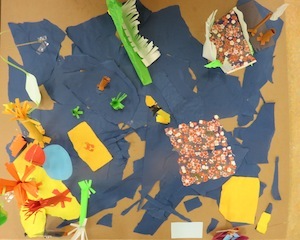 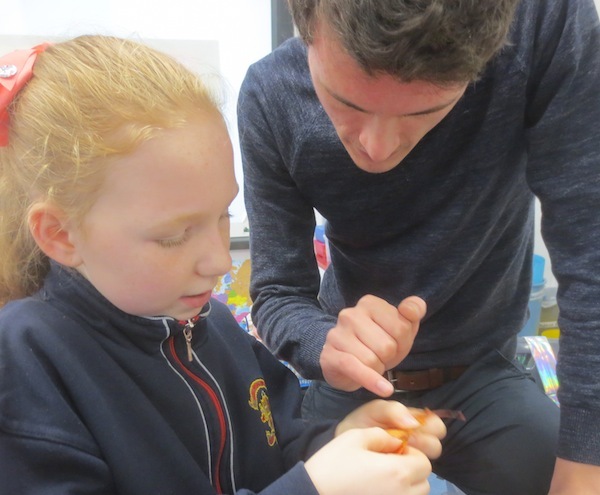 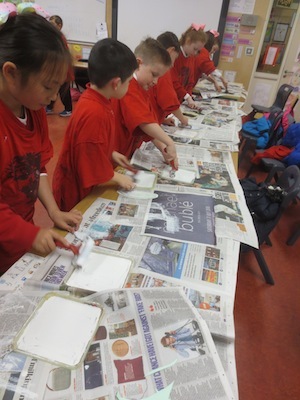 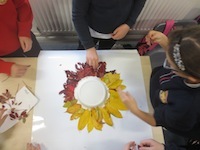 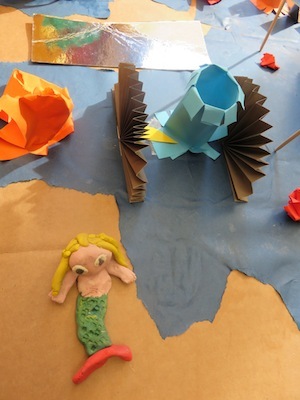 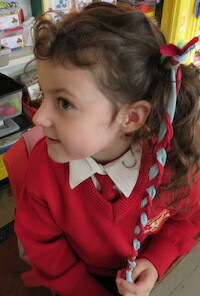 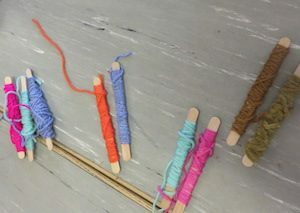 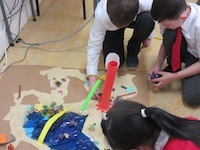 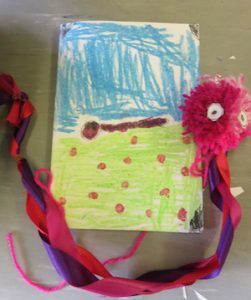 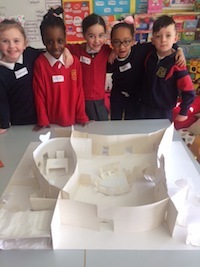 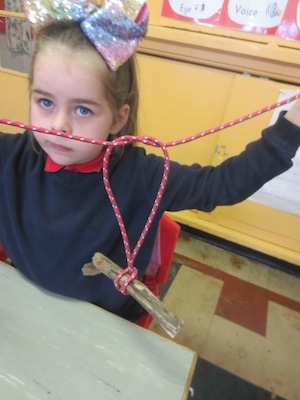 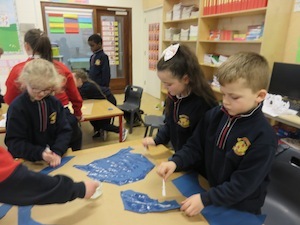 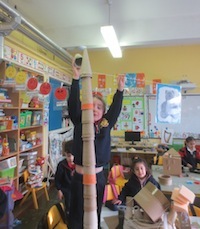 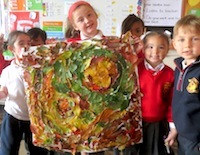 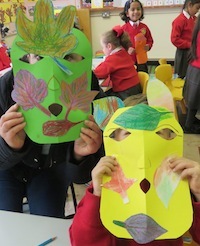 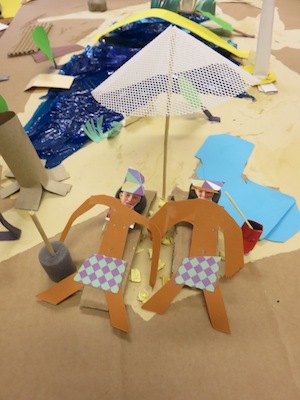 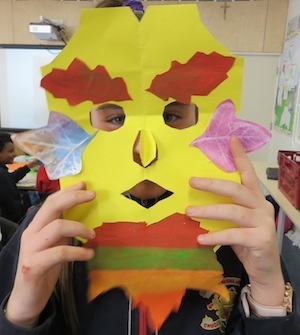 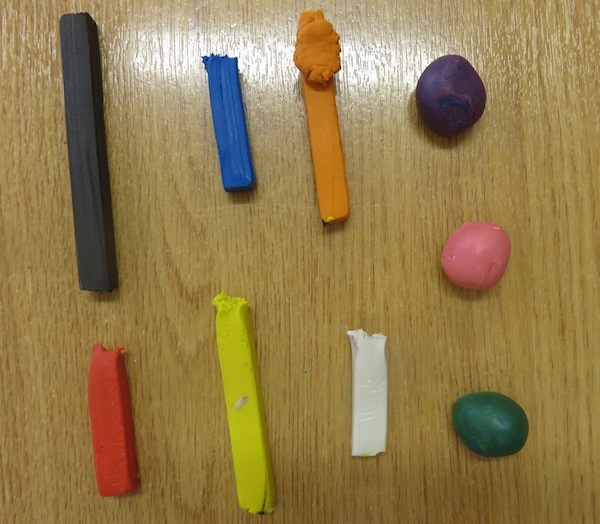 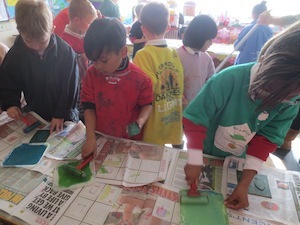 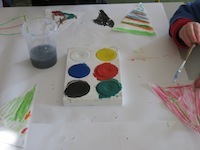 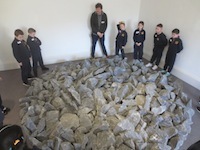 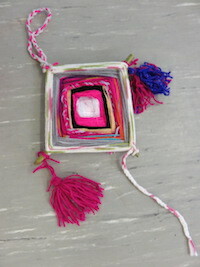 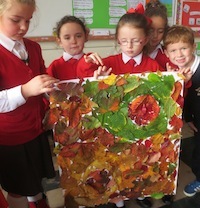 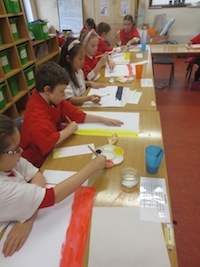 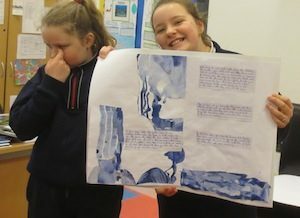 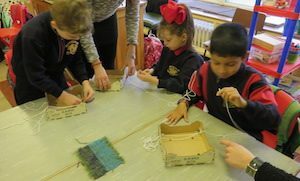 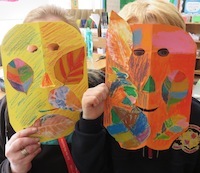 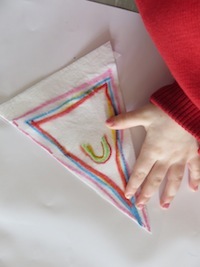 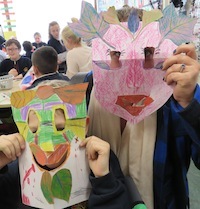 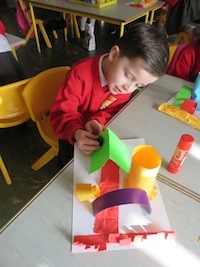 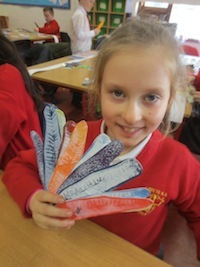 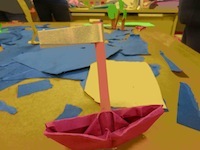 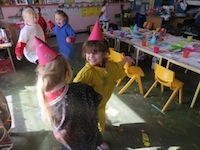 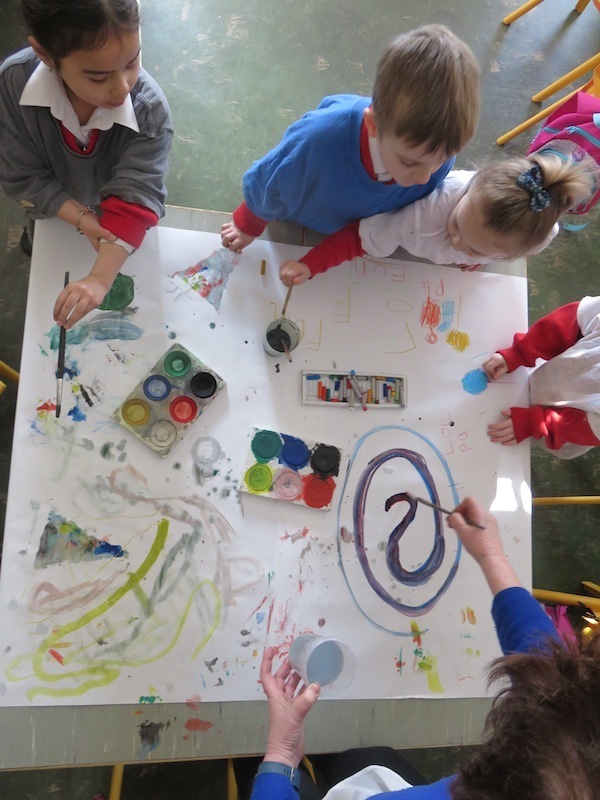 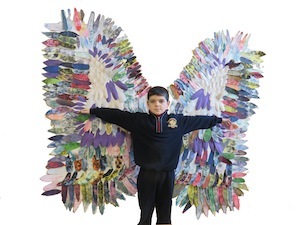 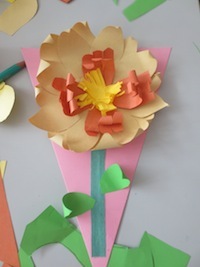 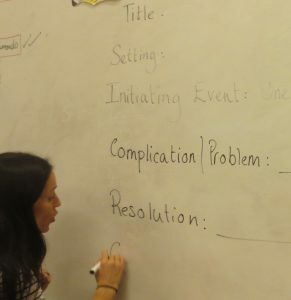 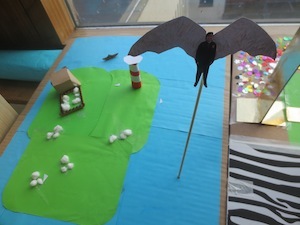 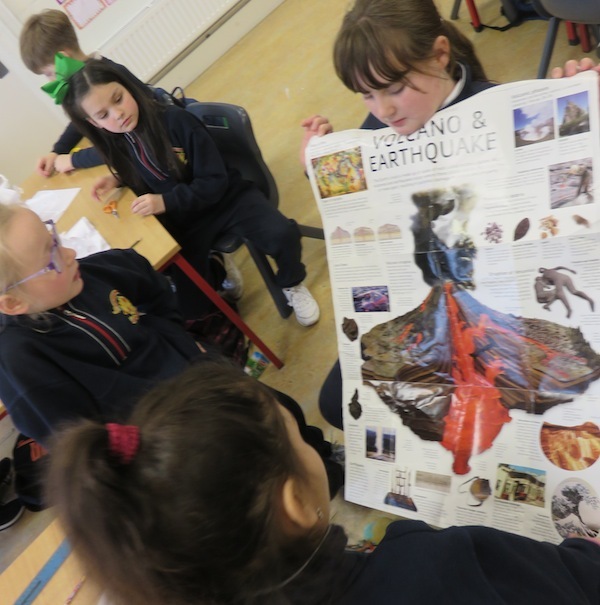 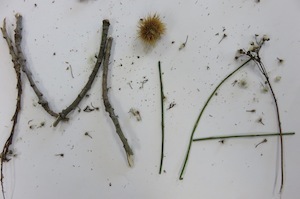 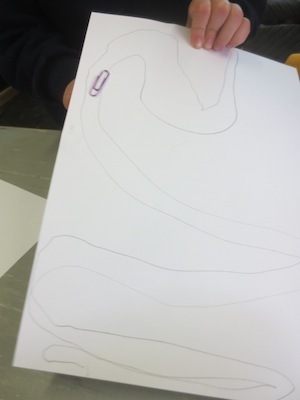 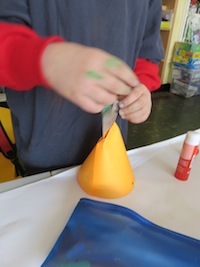 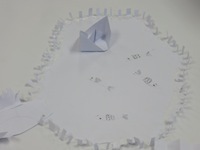 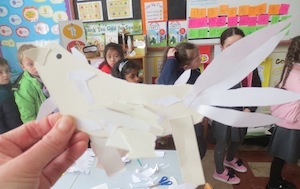 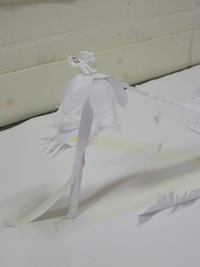 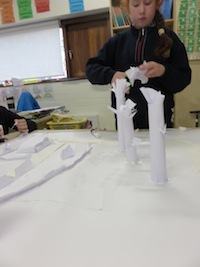 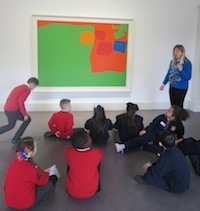 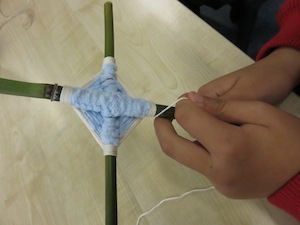 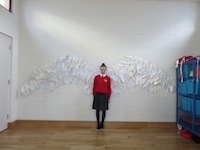 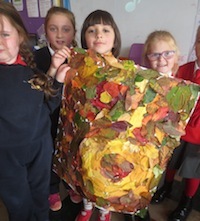 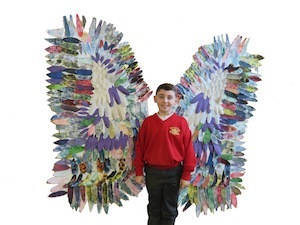 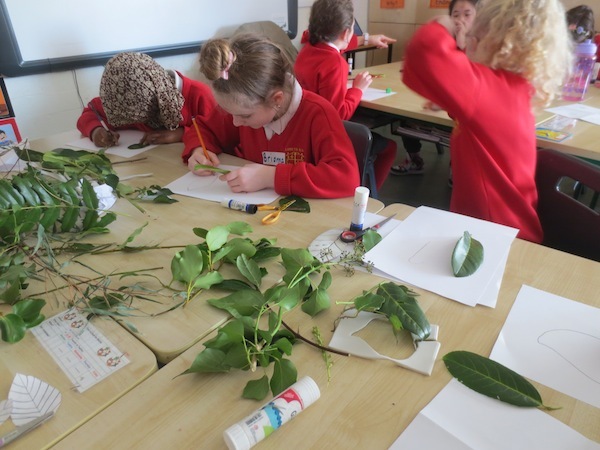 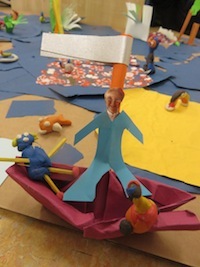 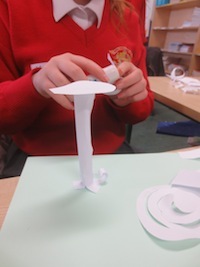 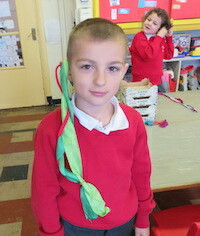 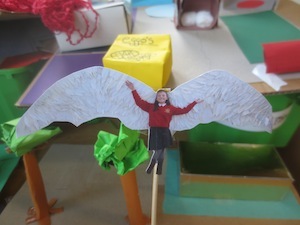 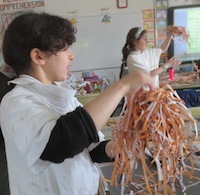 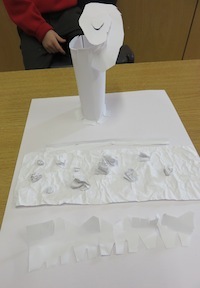 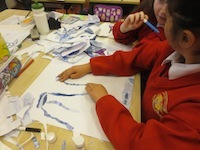 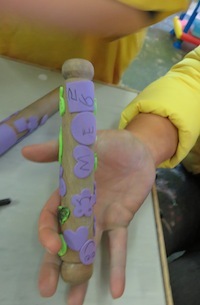 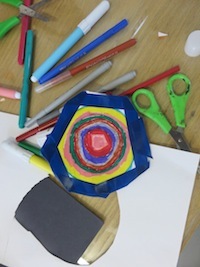 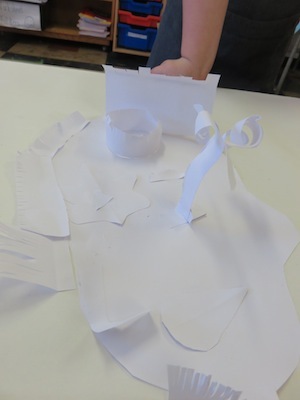 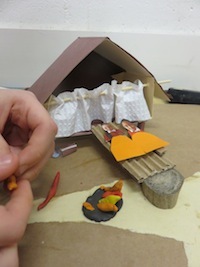 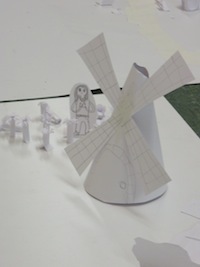 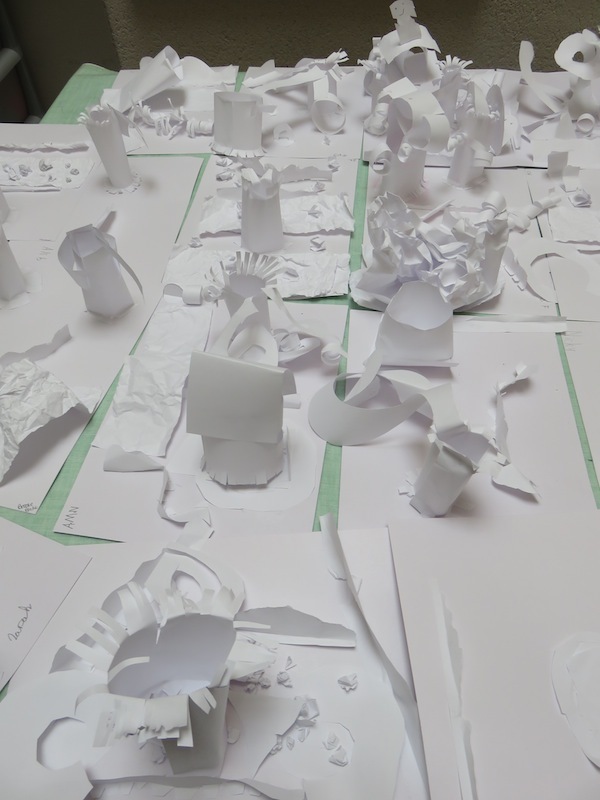 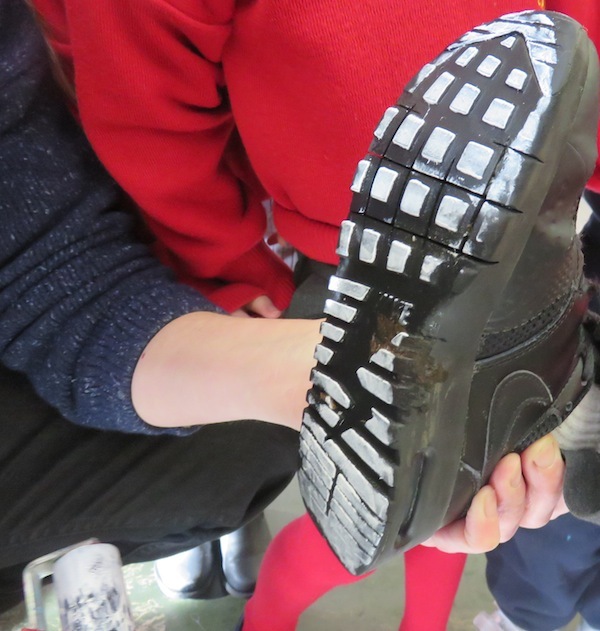 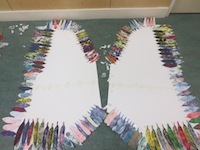 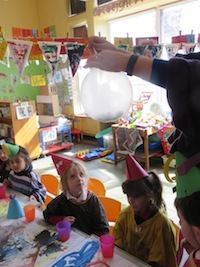 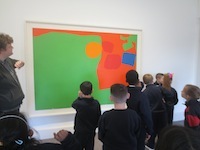 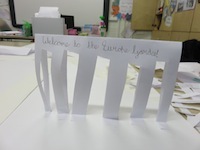 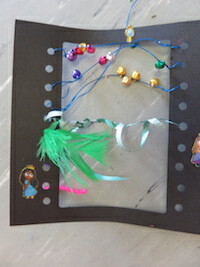 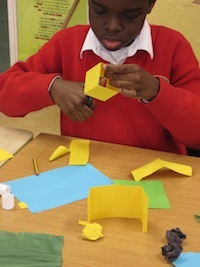 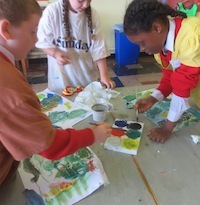 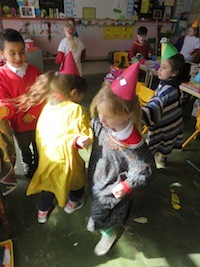 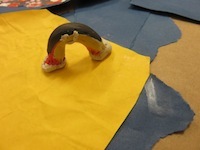 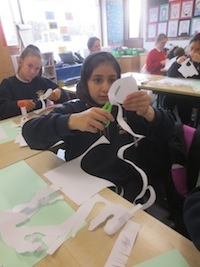 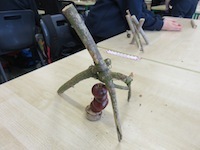 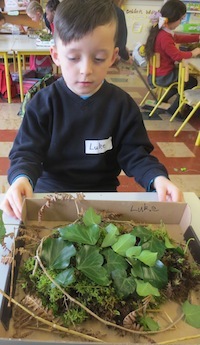 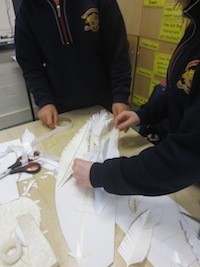 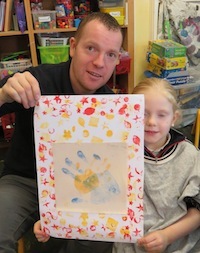 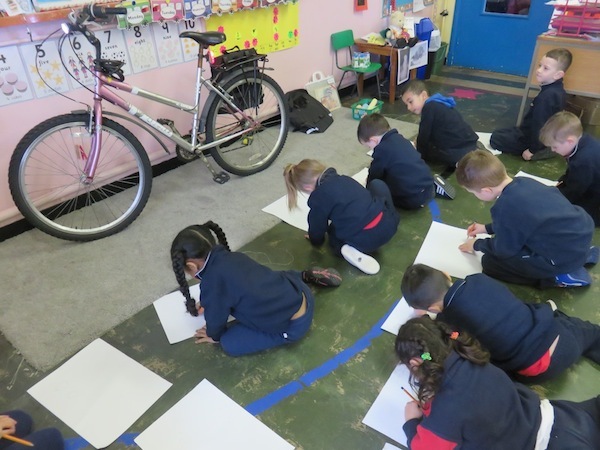 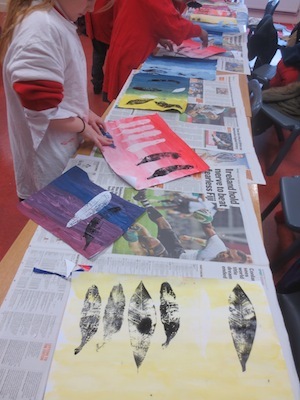 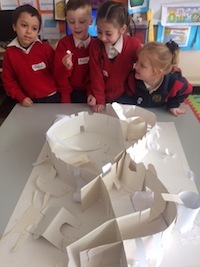 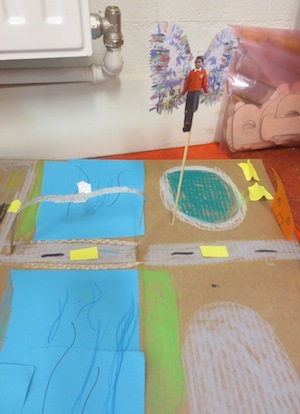 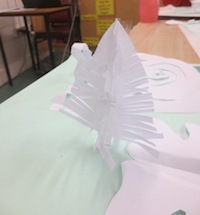 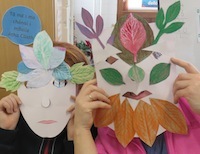 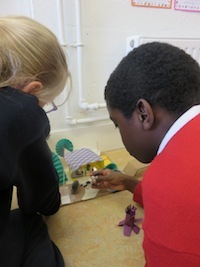 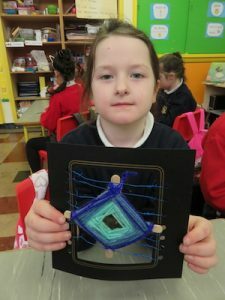 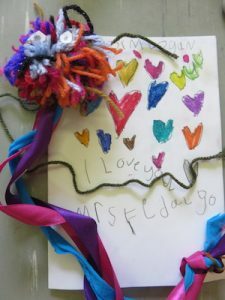 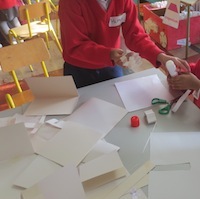 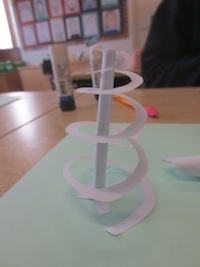 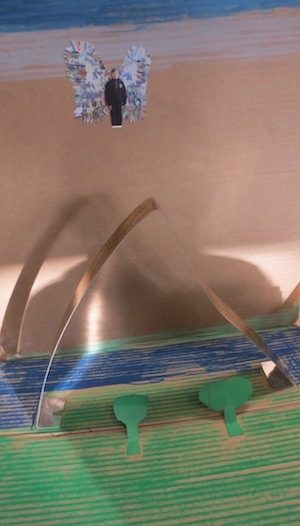 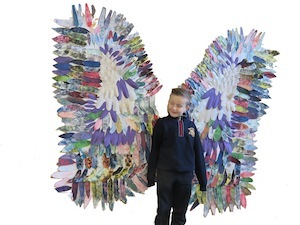 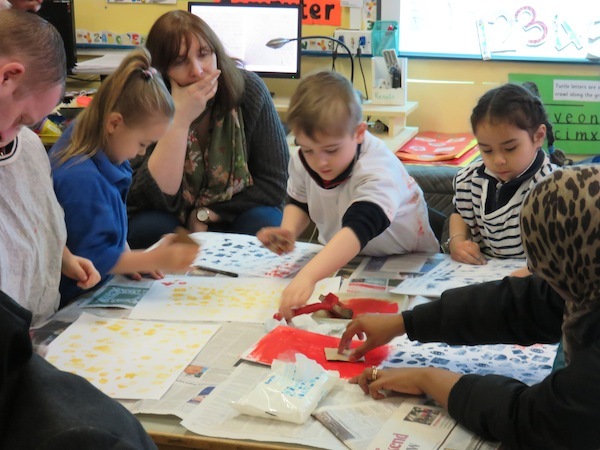 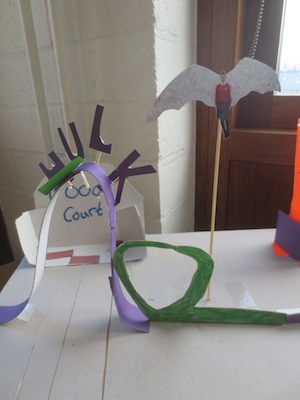 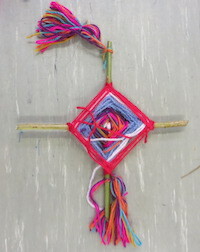 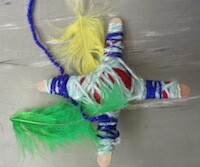 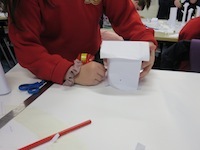 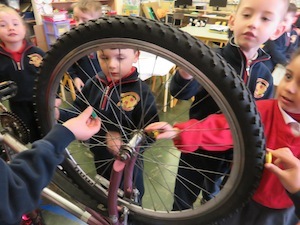 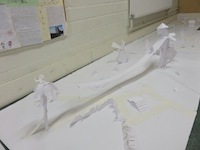 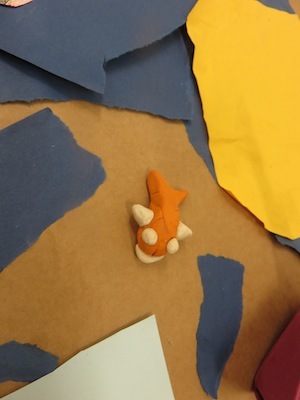 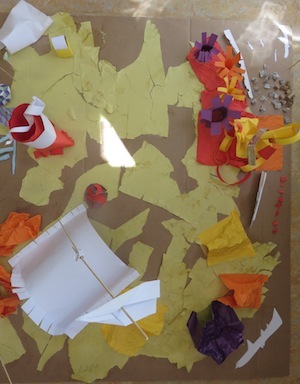 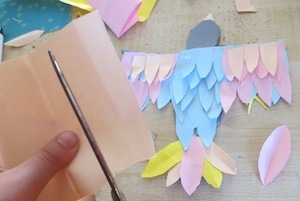 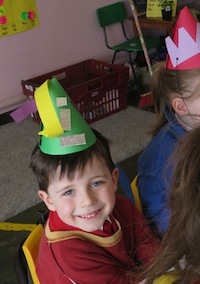 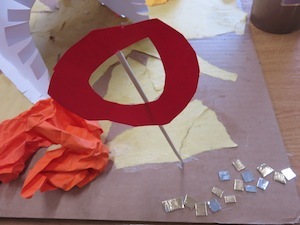 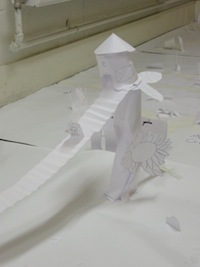 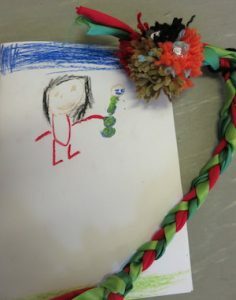 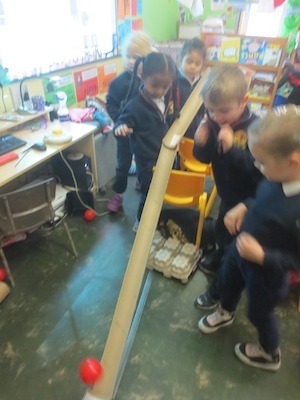 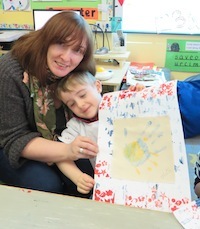 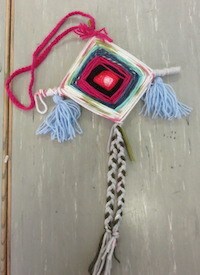 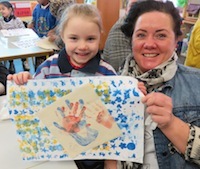 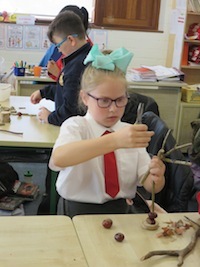 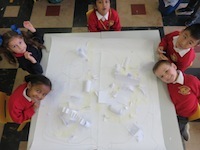 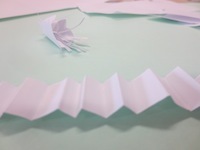 Fourth class began their Creativity in the Classroom sessions on the 1st of February, St.Brigid’s Day. 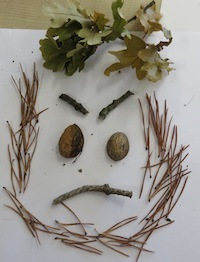 Ms. Bennett and I decided to visit the local park during one of their sessions. 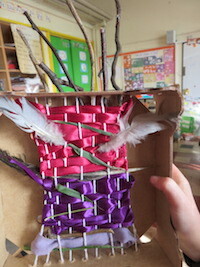 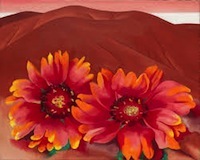 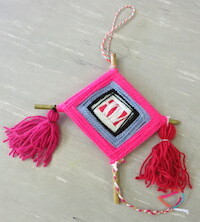 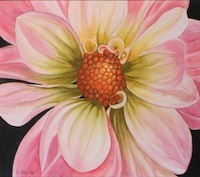 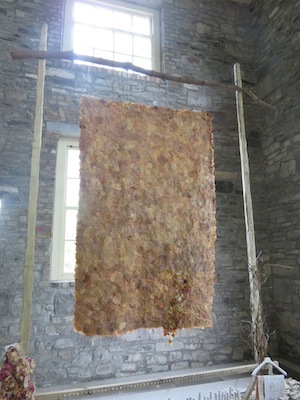 Although we celebrate the beginning of Spring on St. Brigid’s day there was not much sign of it. 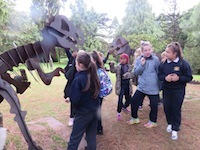 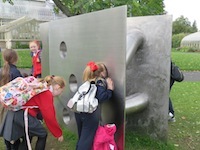 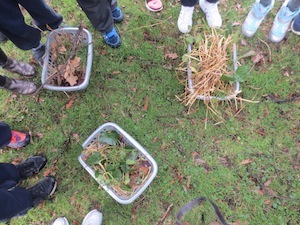 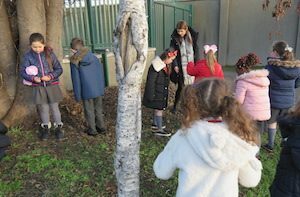 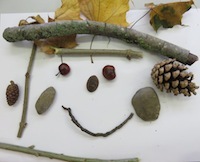 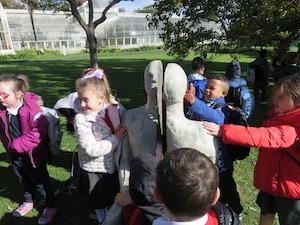 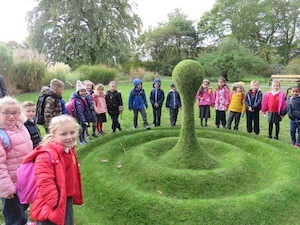 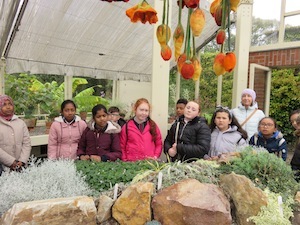 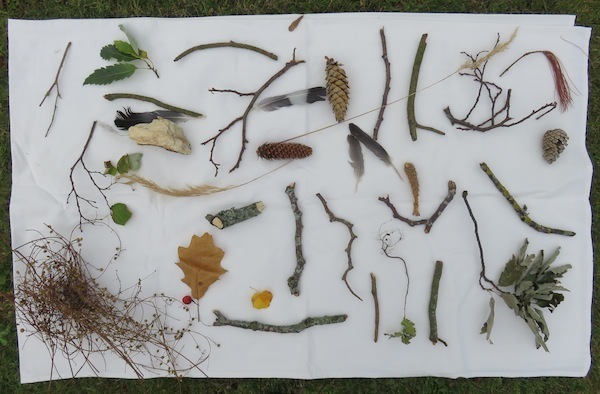 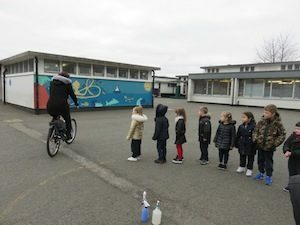 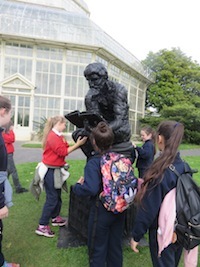 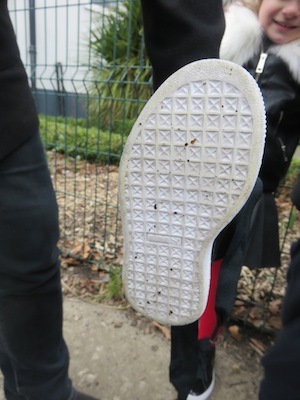 We decided to do some observation of nature to prepare the children for the park. 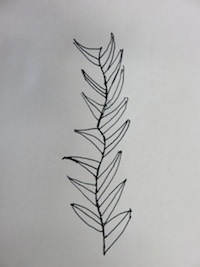 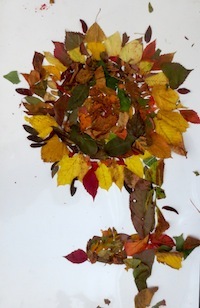 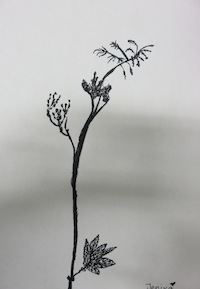 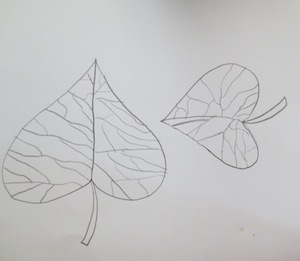 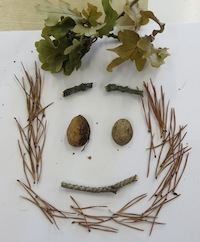 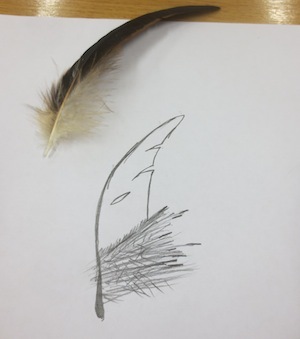 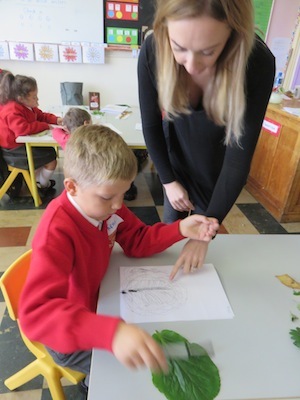 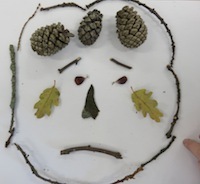 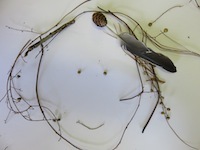 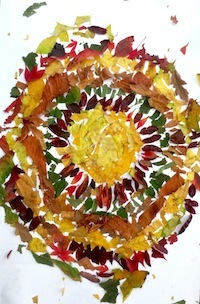 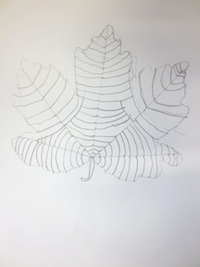 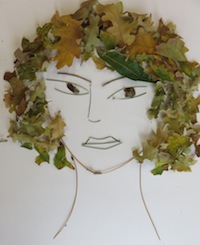 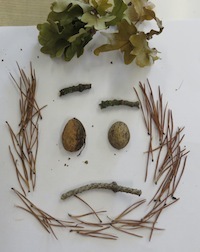 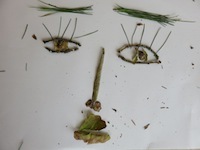 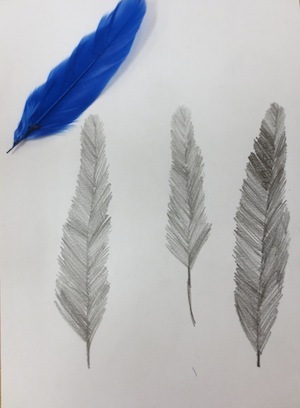 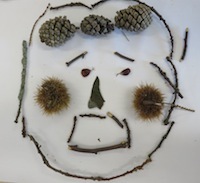 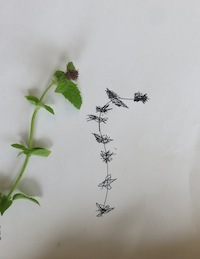 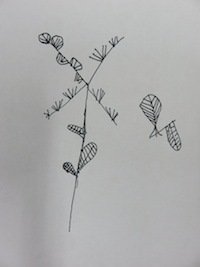 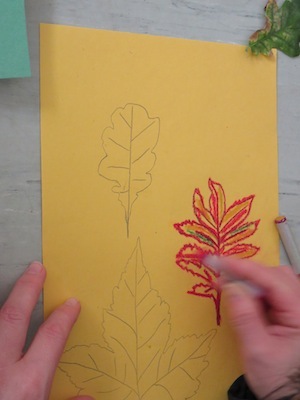 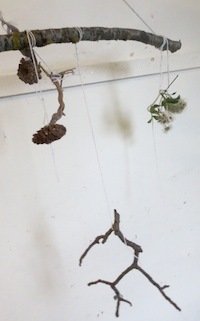 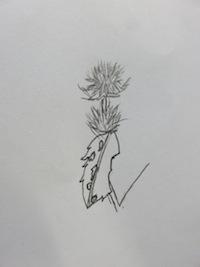 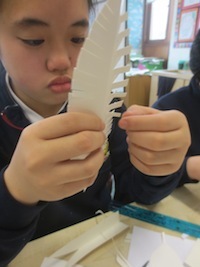 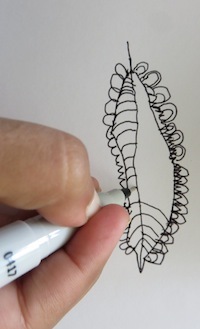 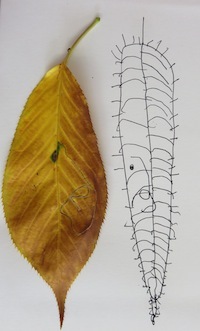 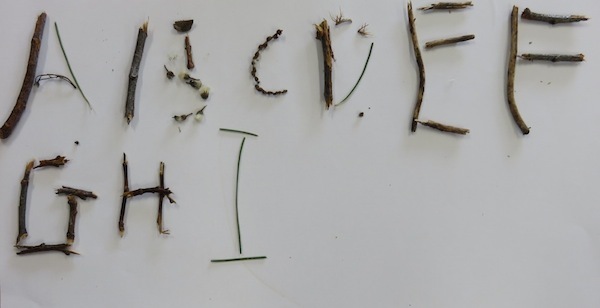 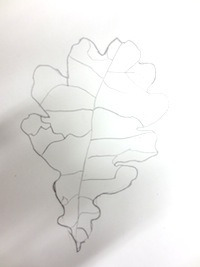 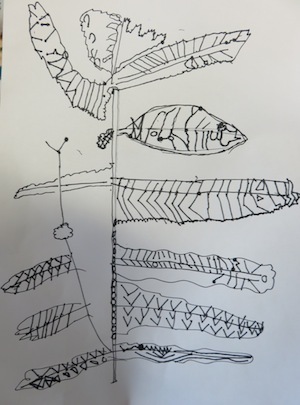 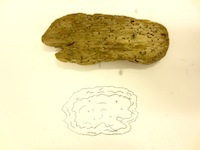 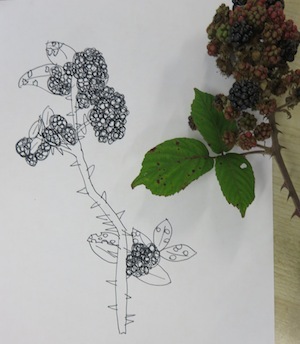 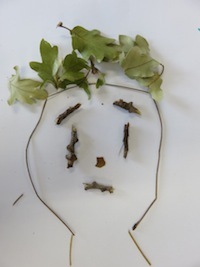 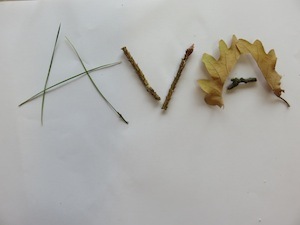 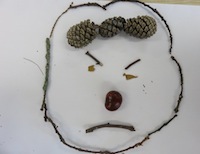 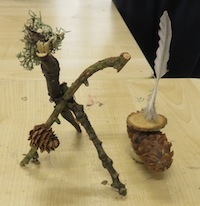 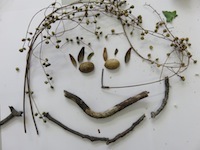 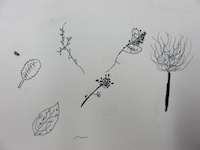 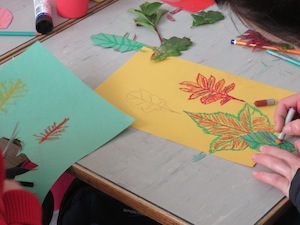 We began drawing from evergreen leaves dried insects. 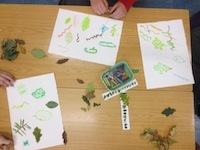 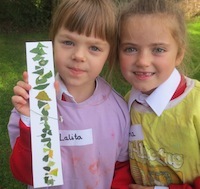 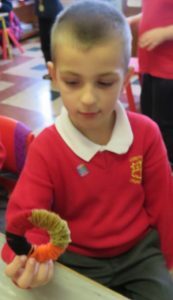 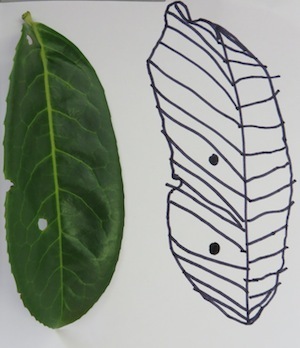 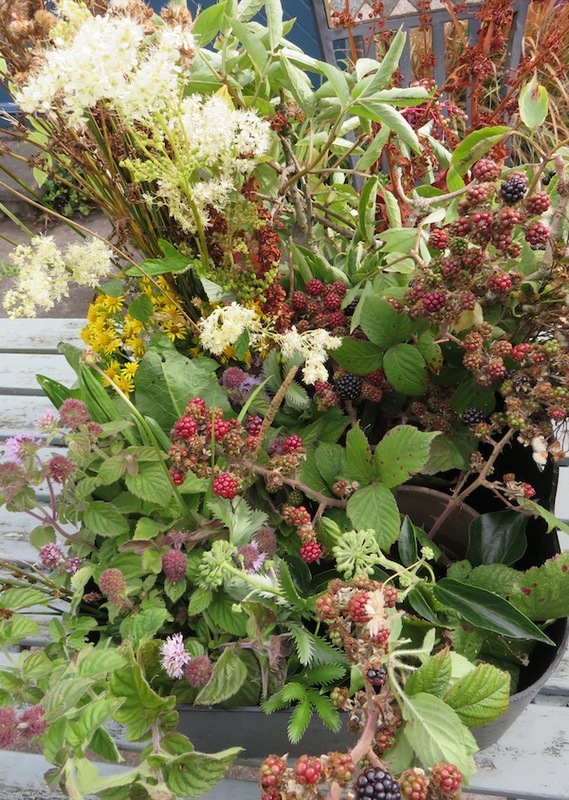 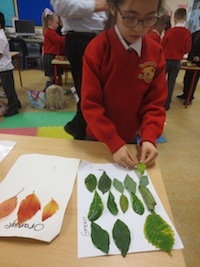 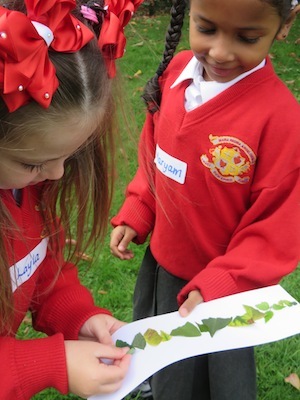 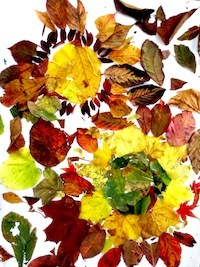 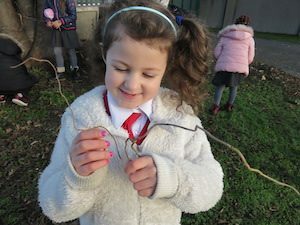 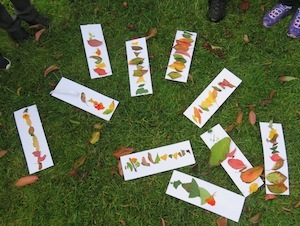 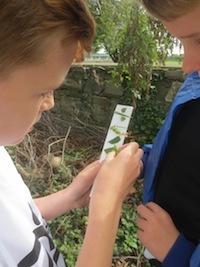 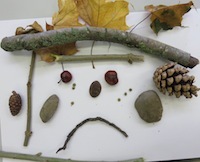 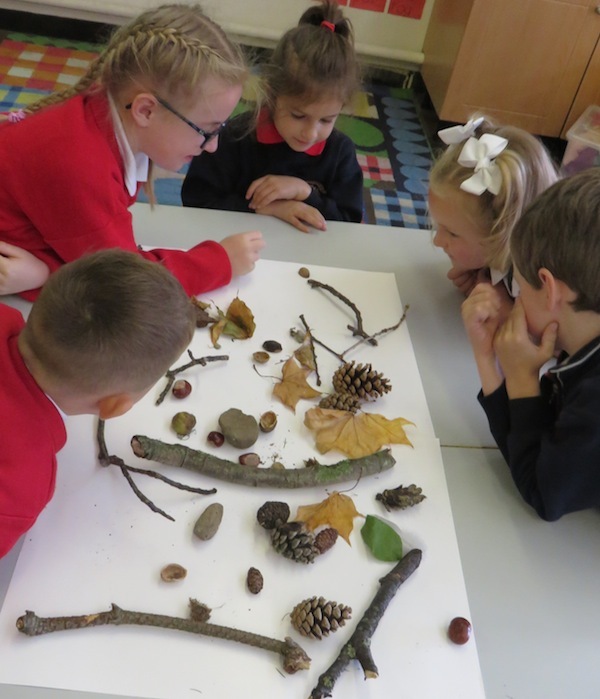 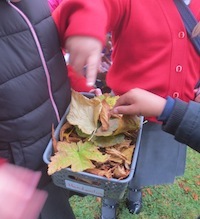 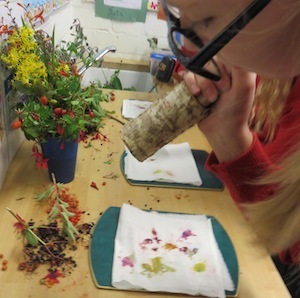 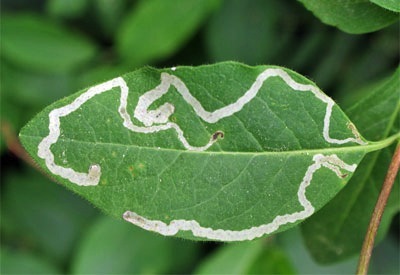 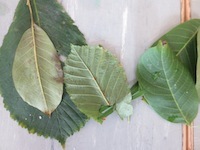 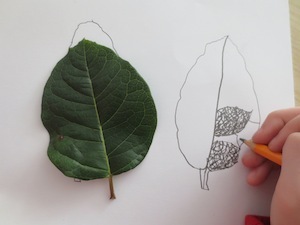 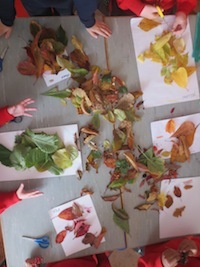 The children used magnifying glasses to look at the patterns in the leaves and insects. 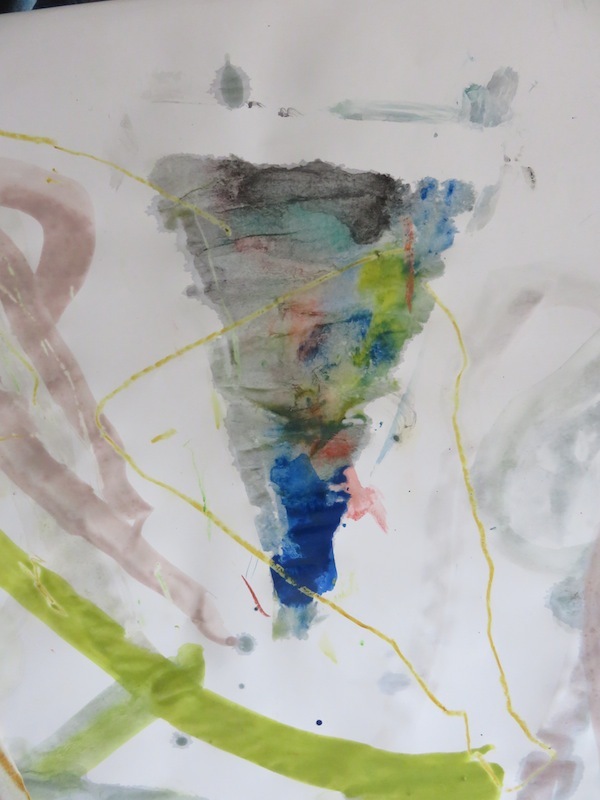 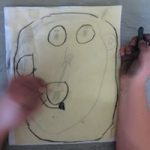 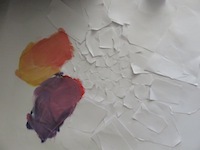 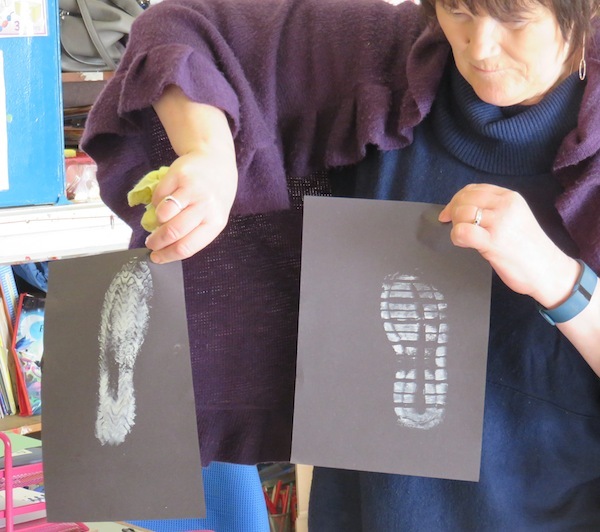 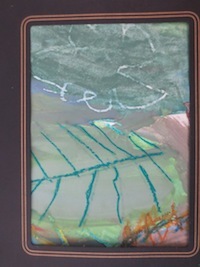 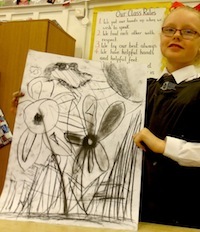 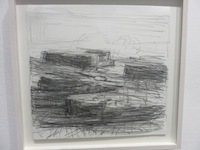 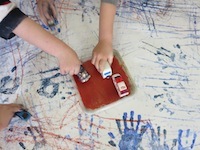 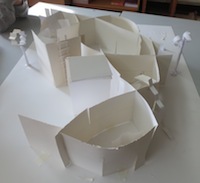 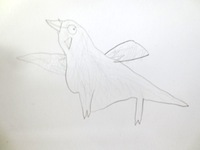 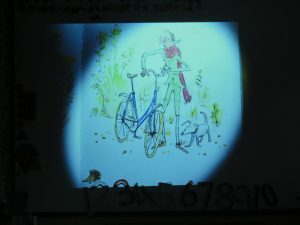 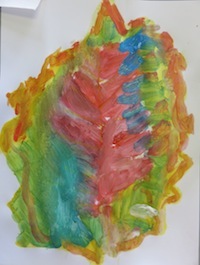 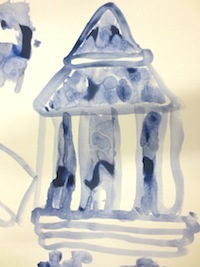 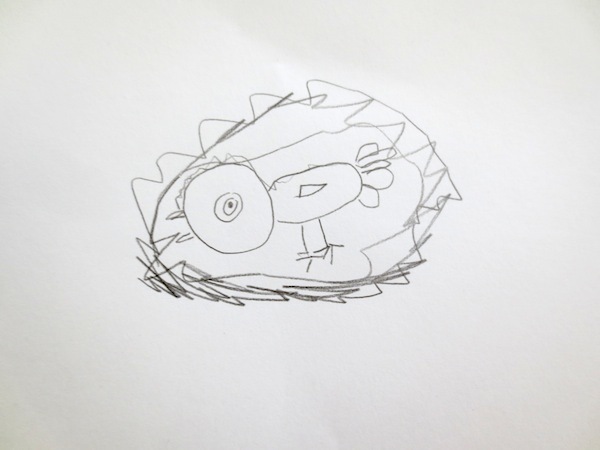 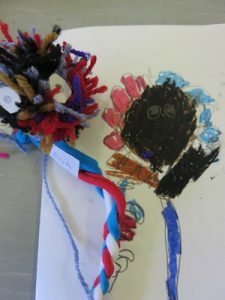 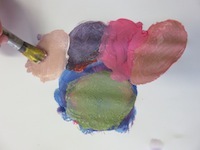 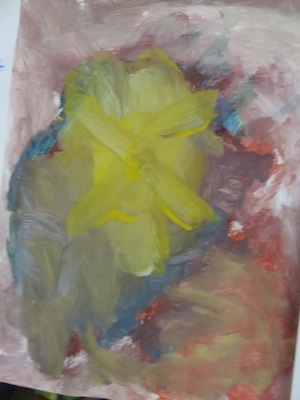 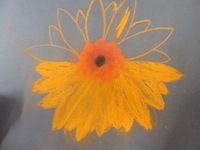 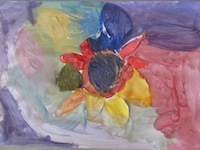 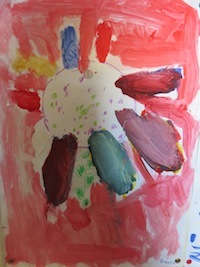 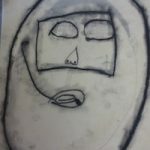 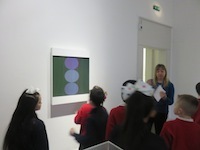 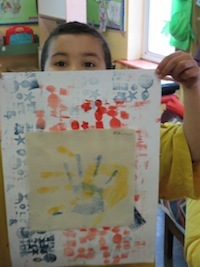 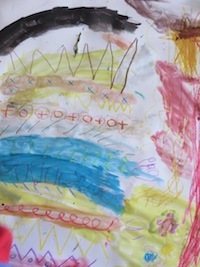 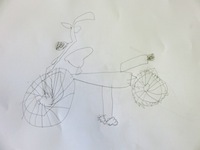 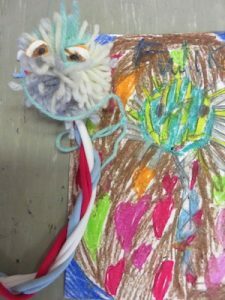 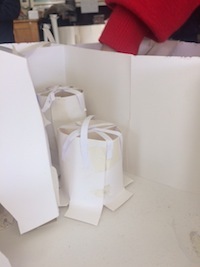 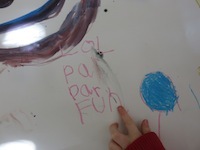 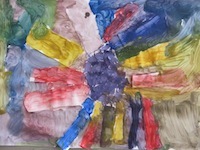 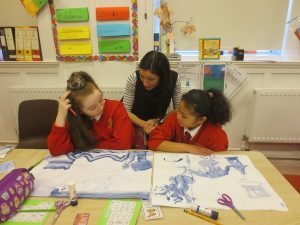 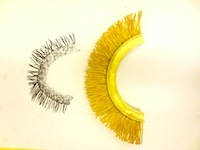 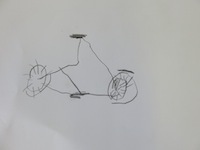 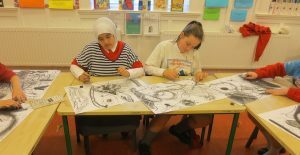 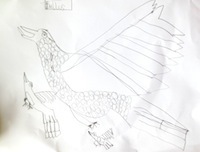 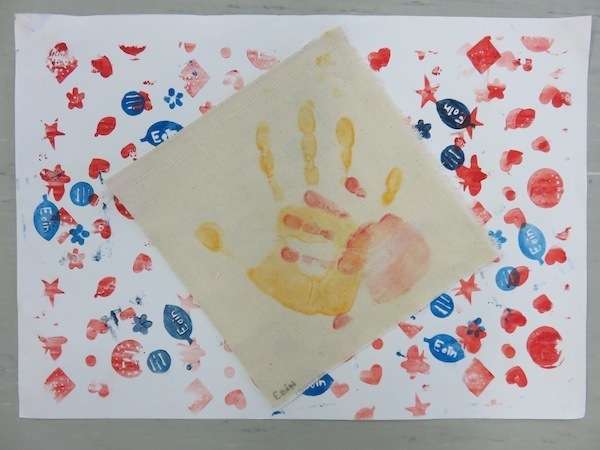 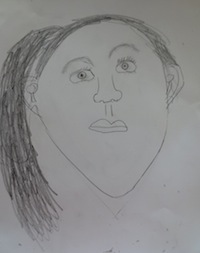 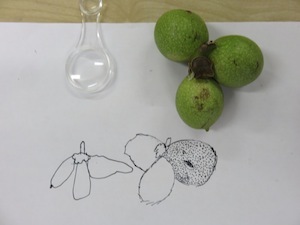 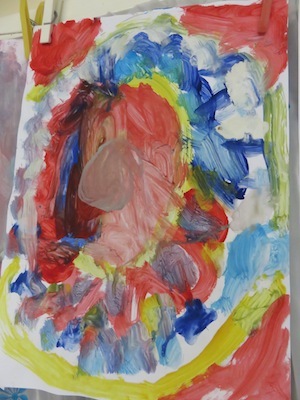 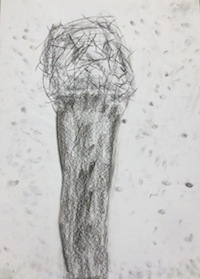 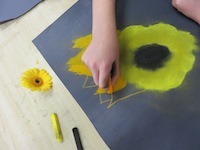 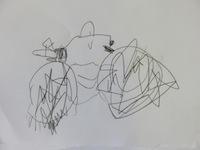 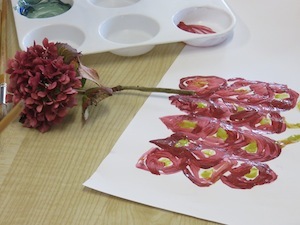 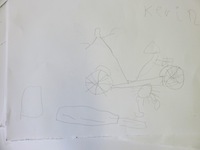 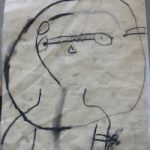 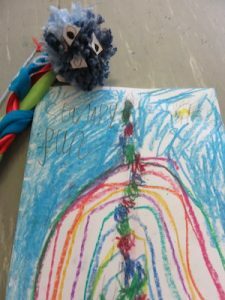 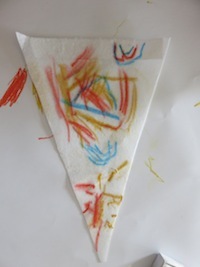 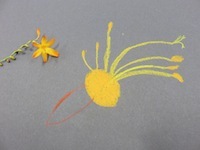 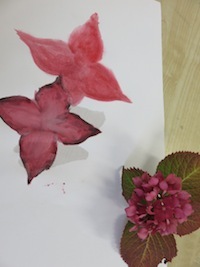 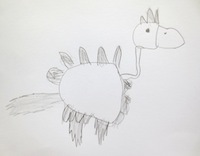 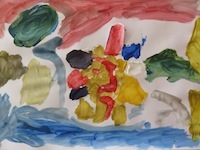 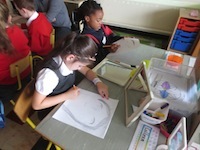 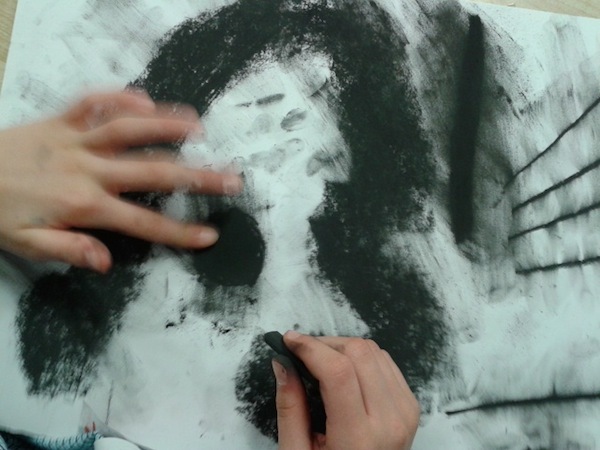 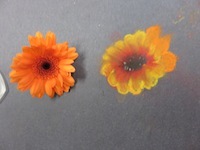 This was their first experience of drawing from observation and their response was very positive. 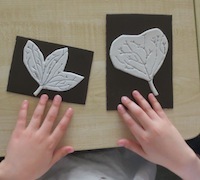 They make print blocks from foam and card. 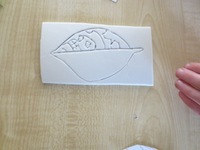 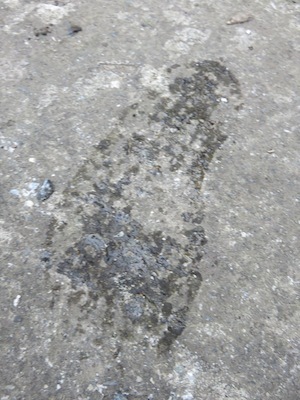 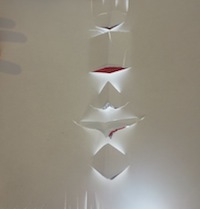 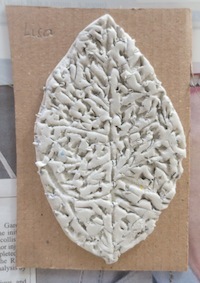 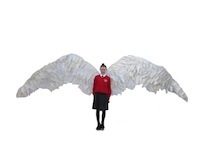 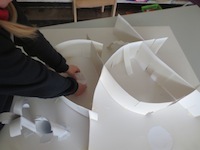 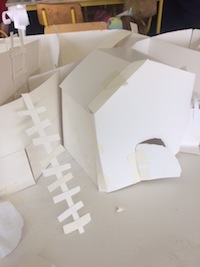 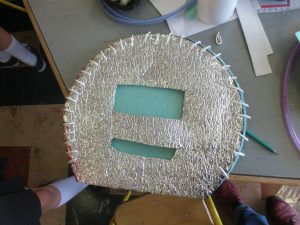 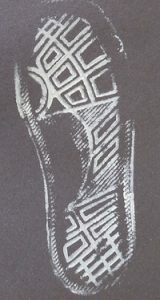 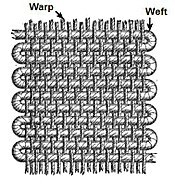 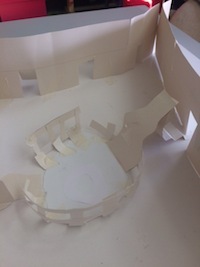 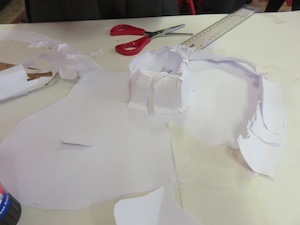 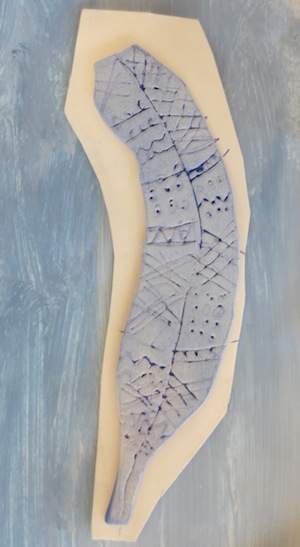 They cut out the shape in the foam and used pen to incise the lines. 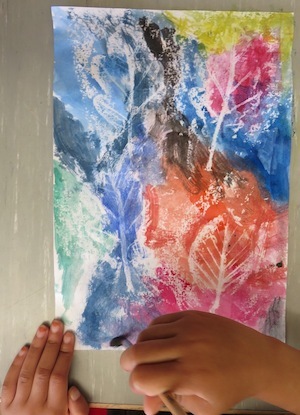 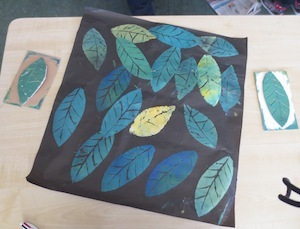 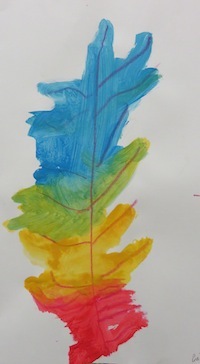 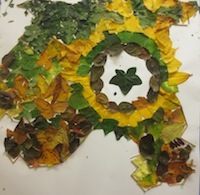 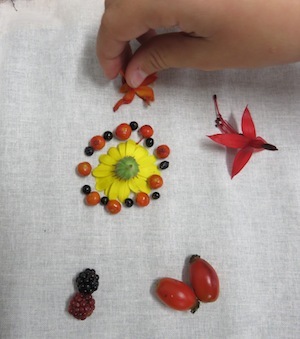 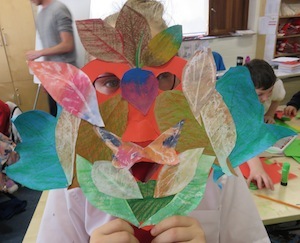 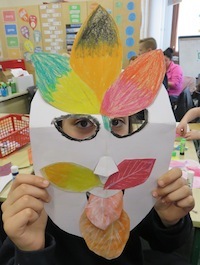 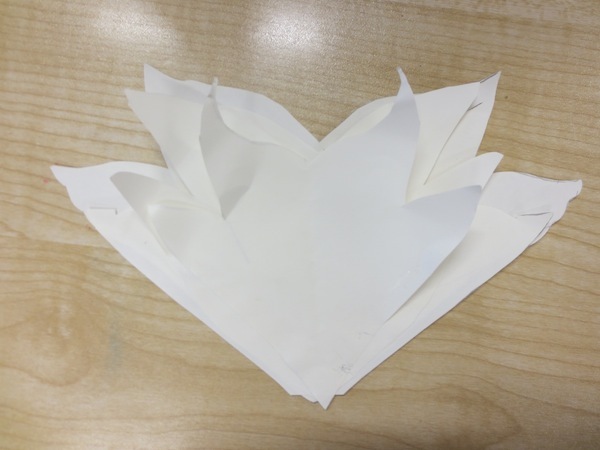 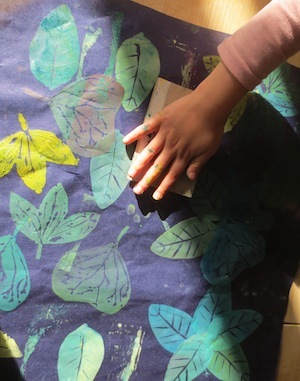 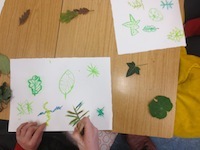 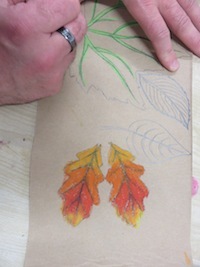 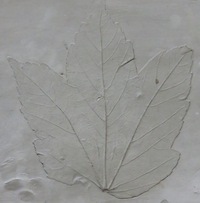 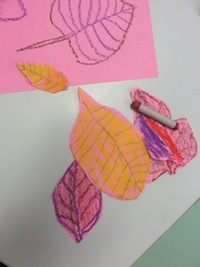 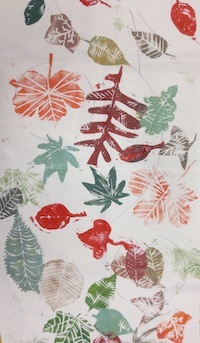 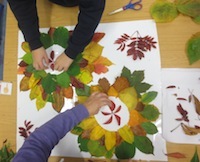 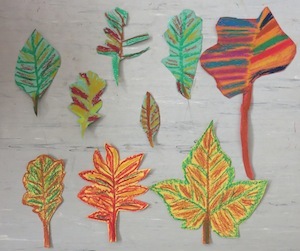 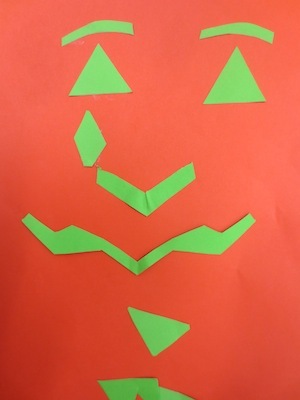 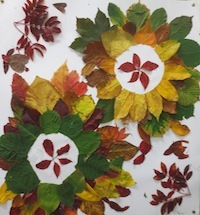 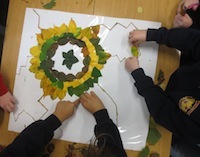 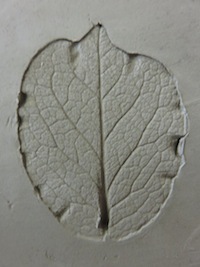 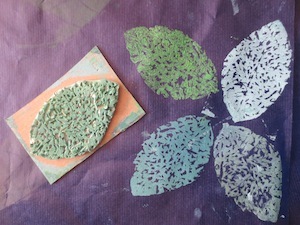 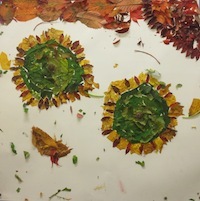 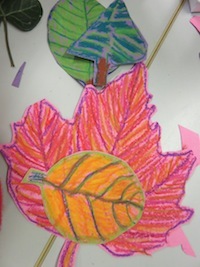 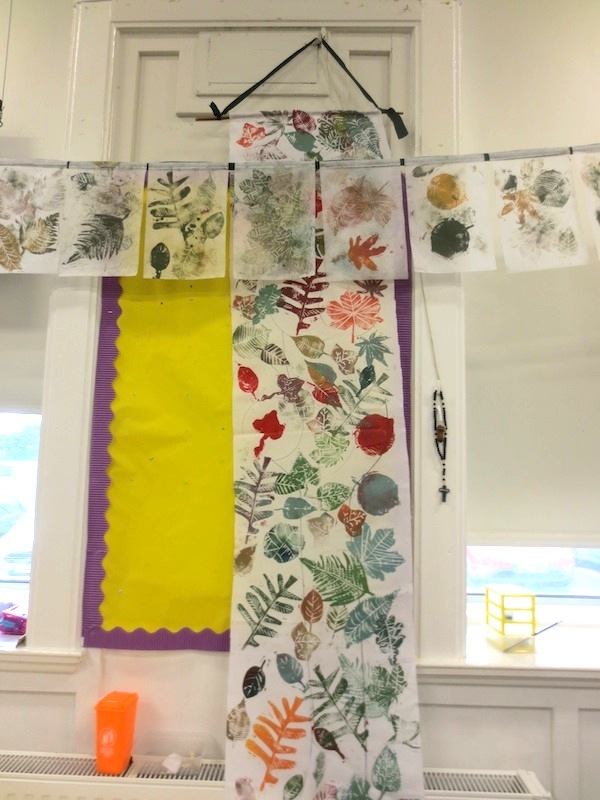 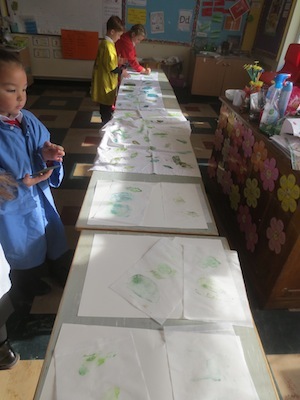 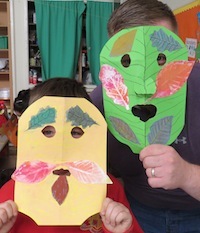 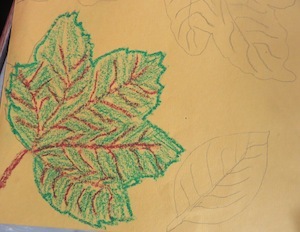 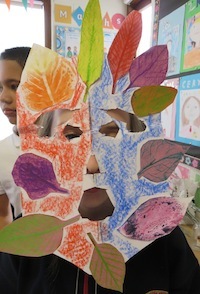 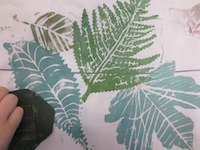 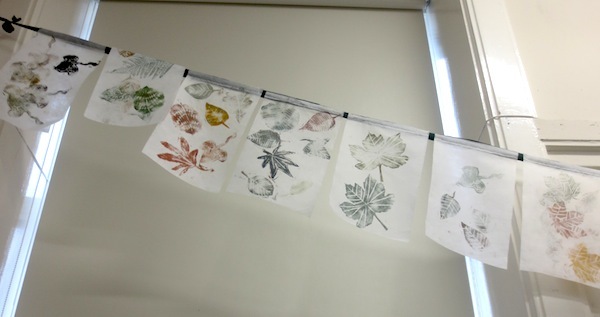 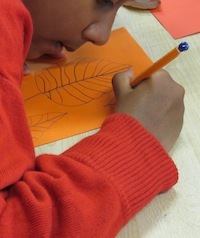 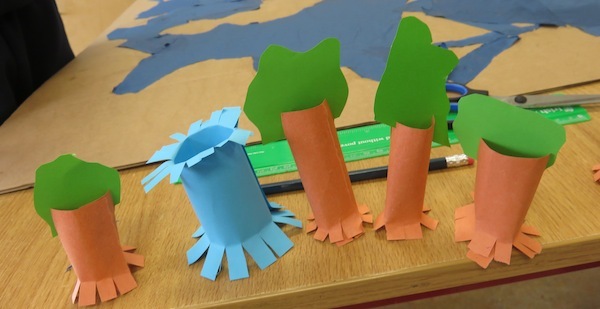 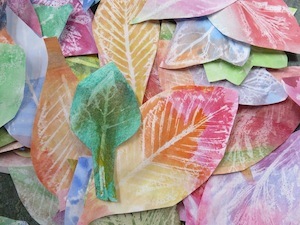 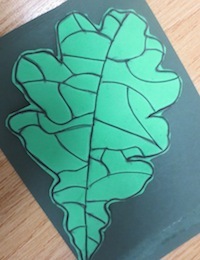 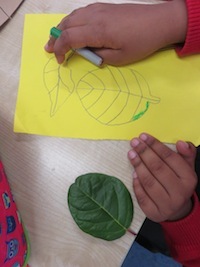 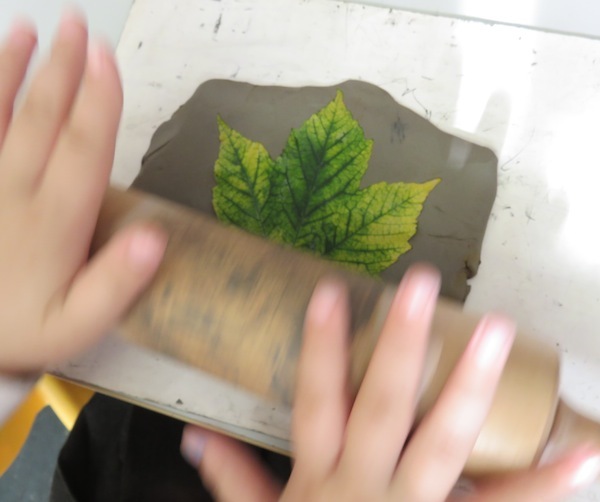 In groups they made leaf pattern prints. 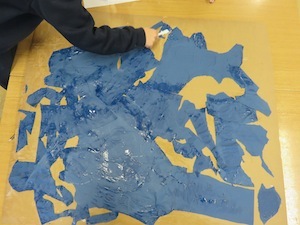 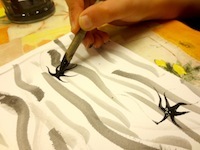 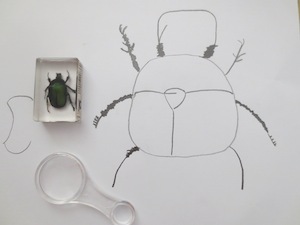 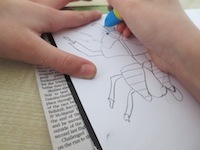 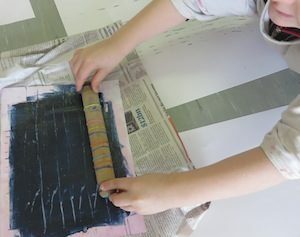 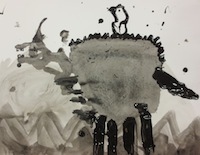 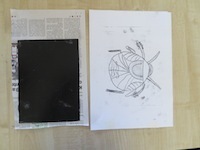 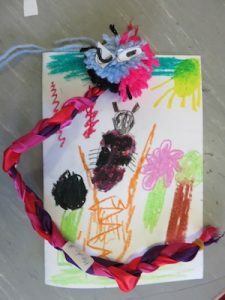 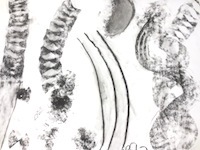 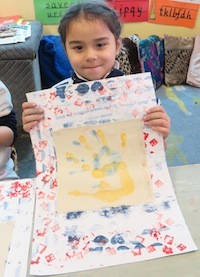 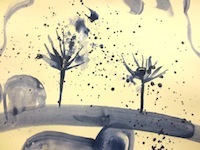 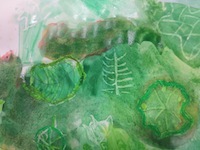 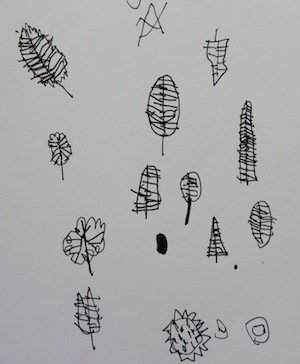 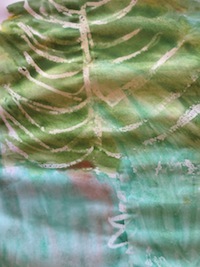 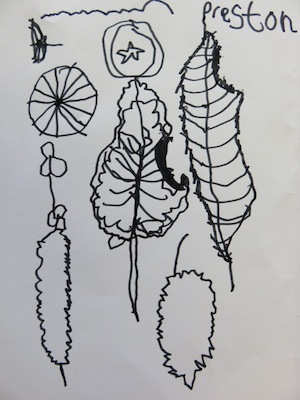 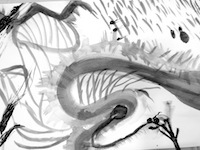 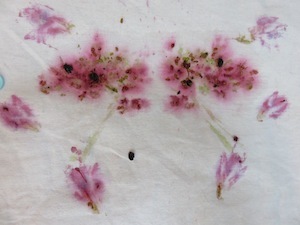 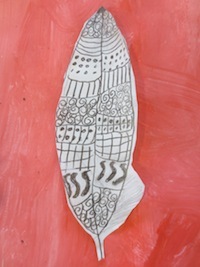 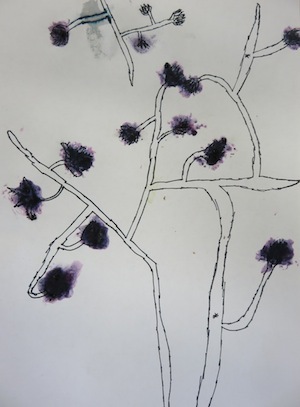 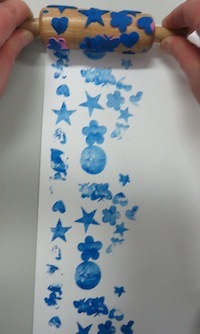 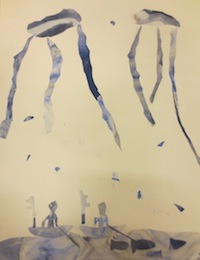 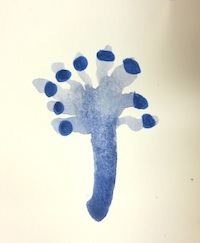 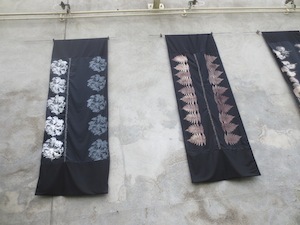 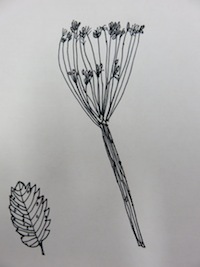 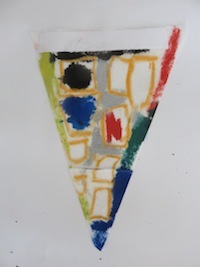 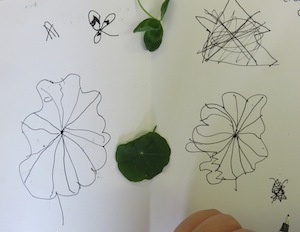 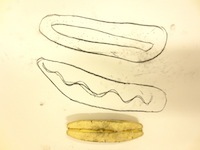 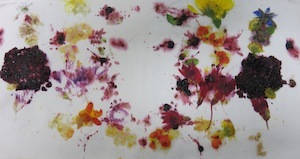 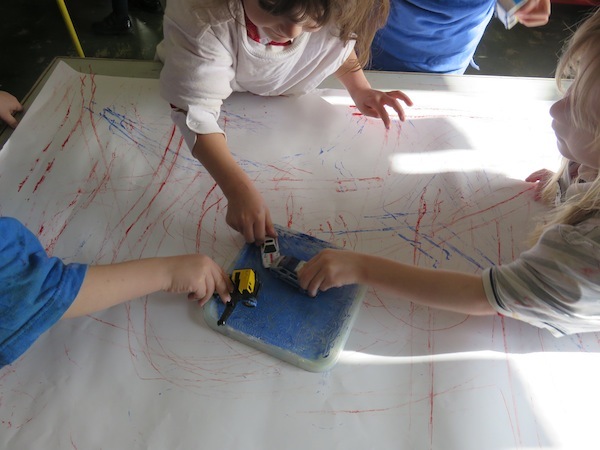 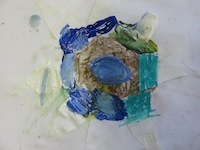 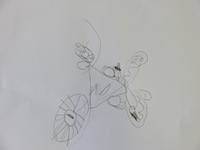 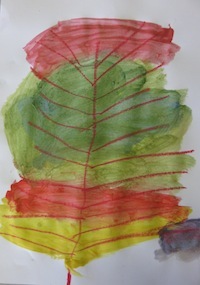 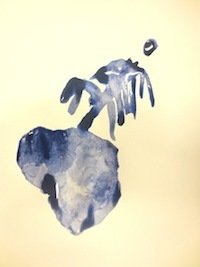 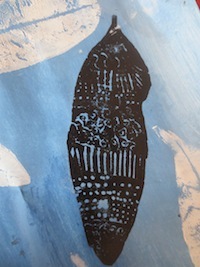 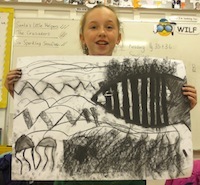 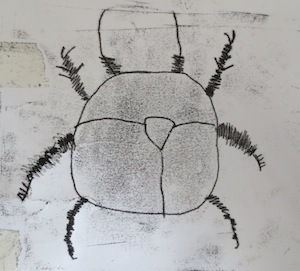 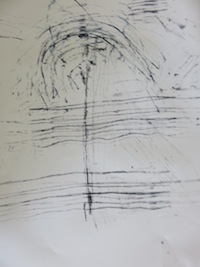 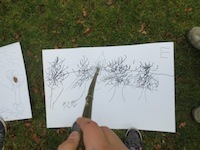 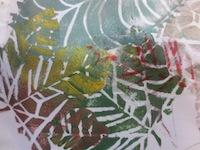 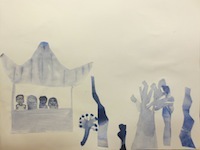 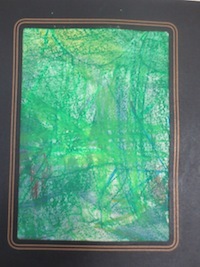 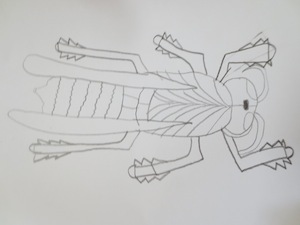 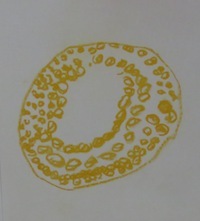 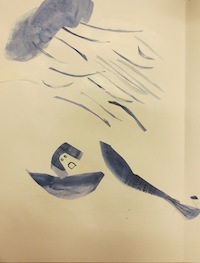 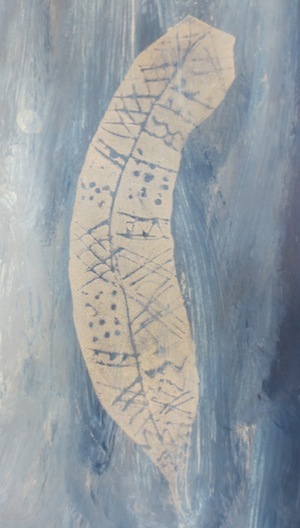 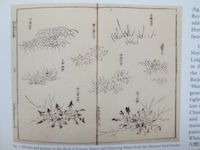 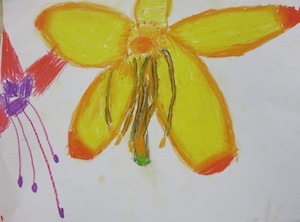 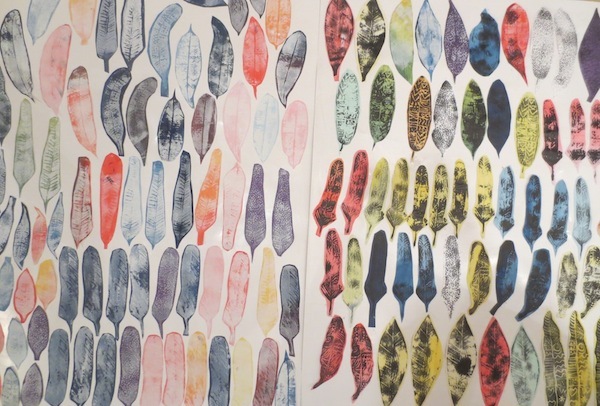 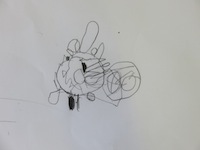 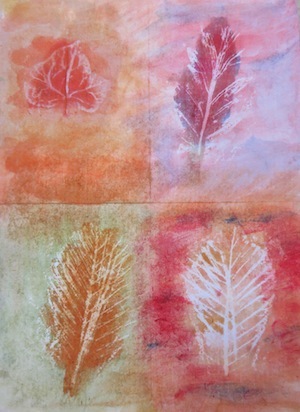 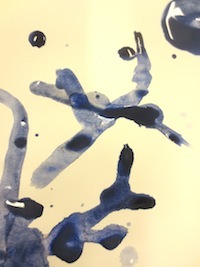 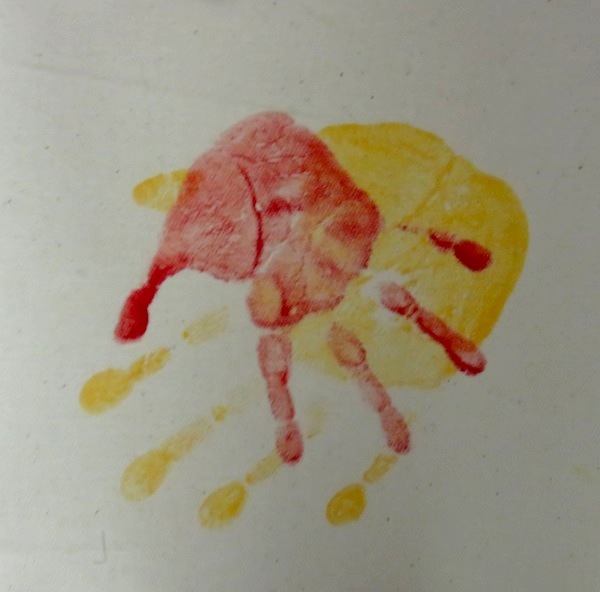 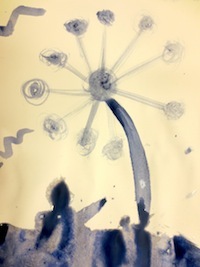 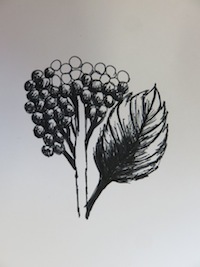 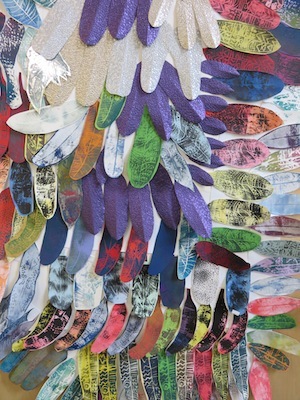 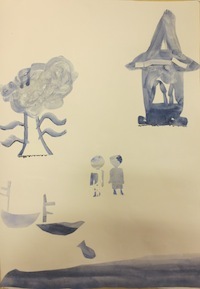 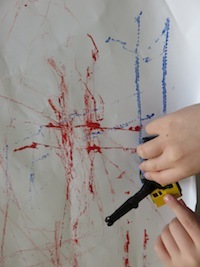 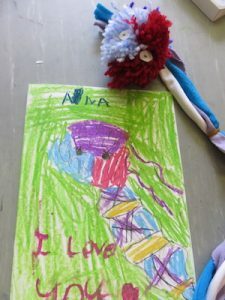 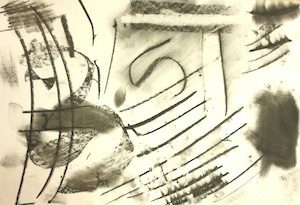 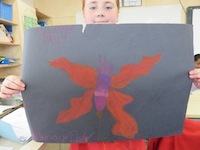 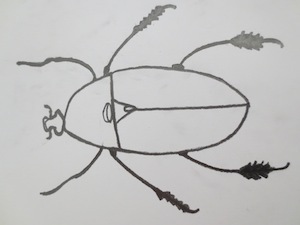 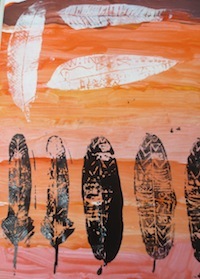 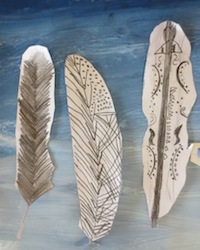 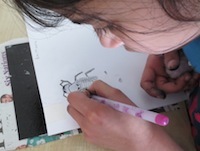 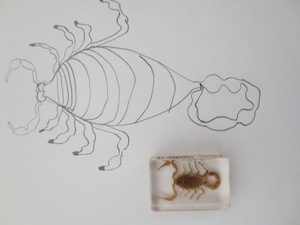 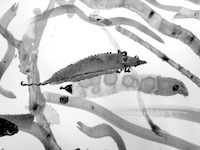 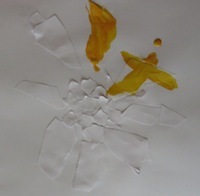 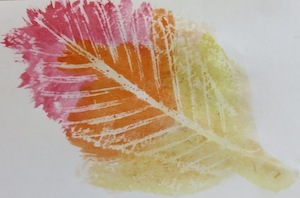 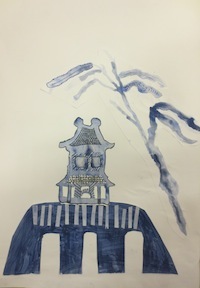 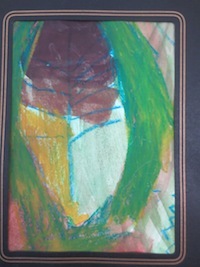 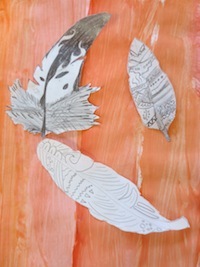 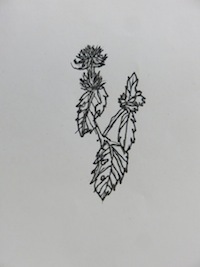 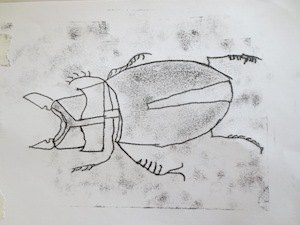 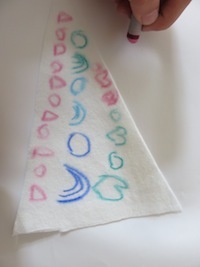 From their insect drawings they each made a mono-print. 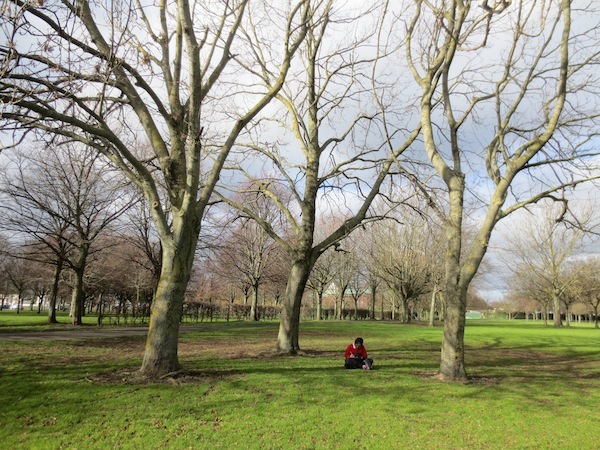 Finally we got a lovely day to go down to the park to work. 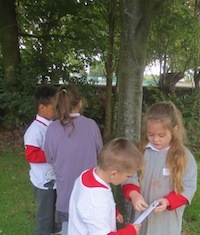 We began by working out the directions 0f a compass. 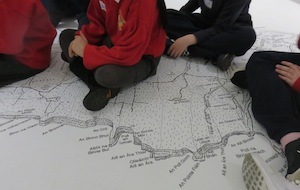 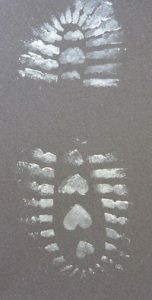 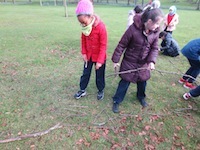 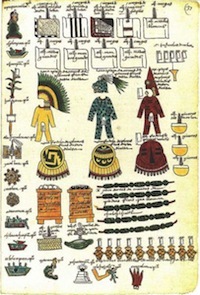 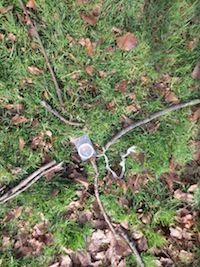 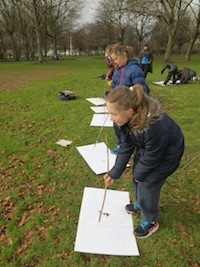 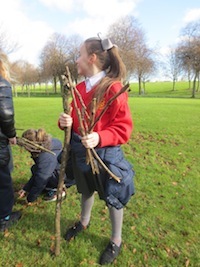 The children marked in North, South, East and West on the ground using sticks. 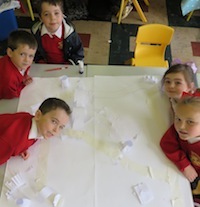 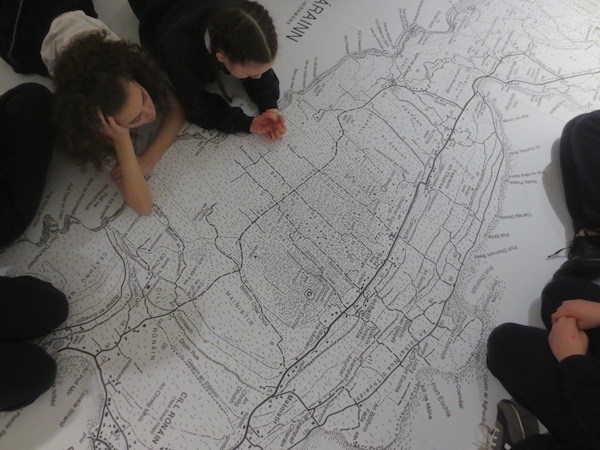 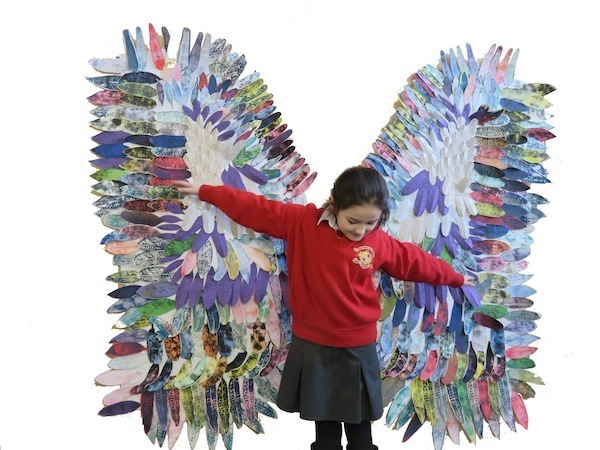 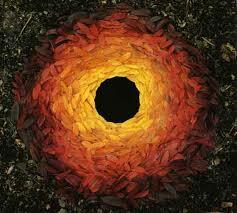 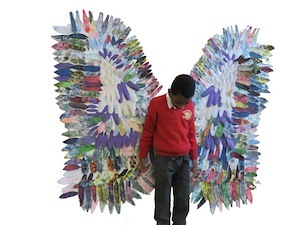 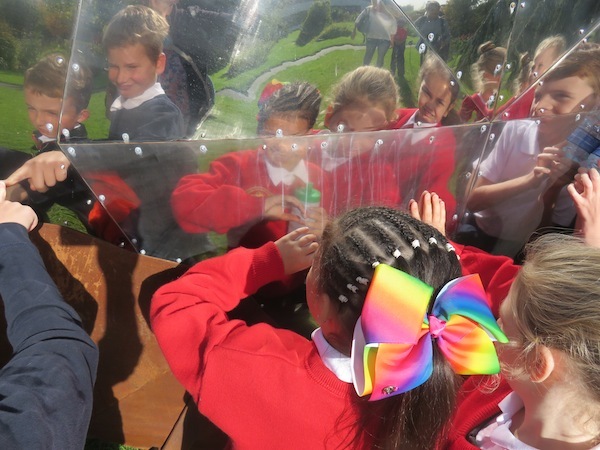 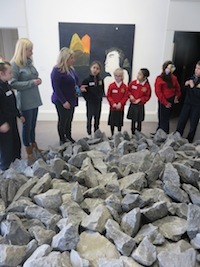 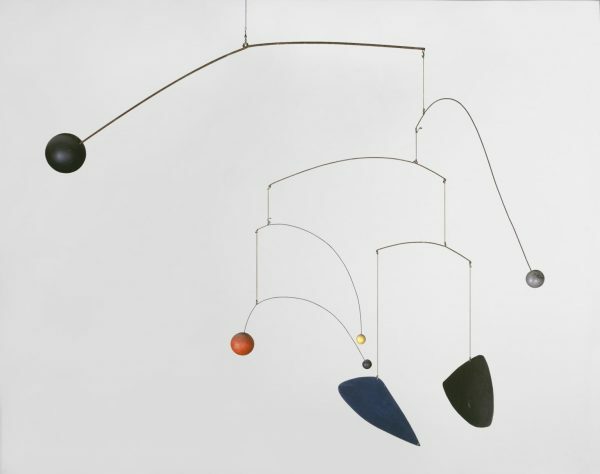 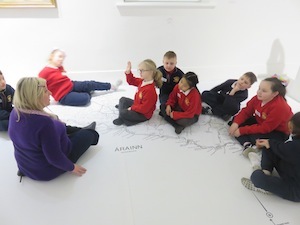 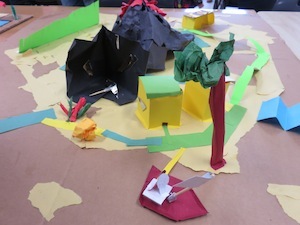 Then everyone faced north, closed their eyes and used their senses to feel what it is like. 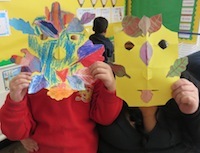 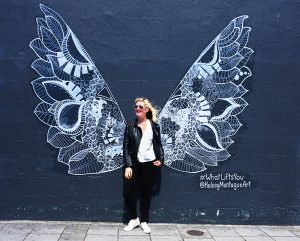 Could they feel the sun? 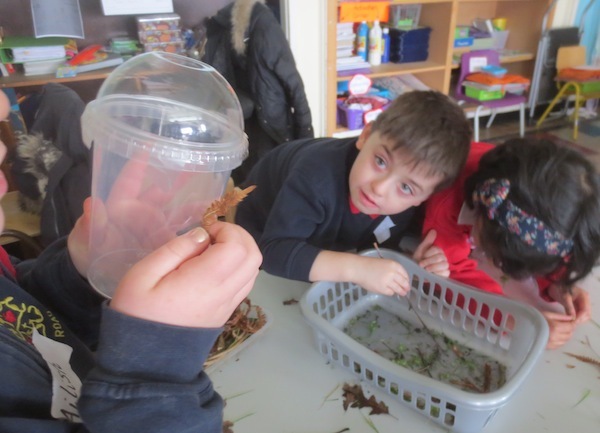 Could they feel the wind on their cheeks? 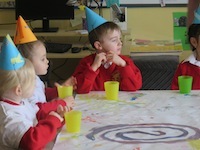 What could they hear? 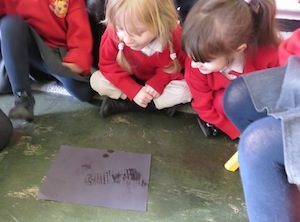 What could they see? 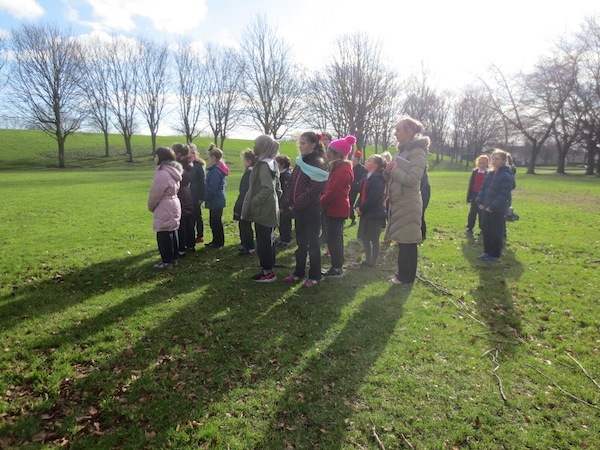 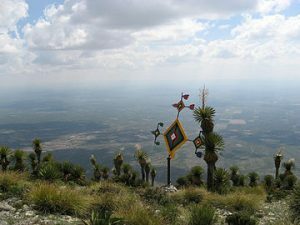 We looked at the views from all directions. 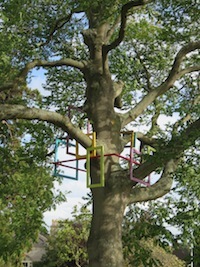 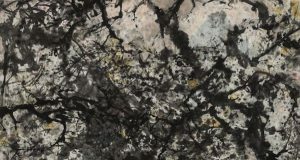 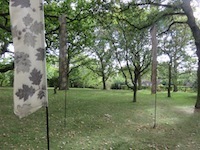 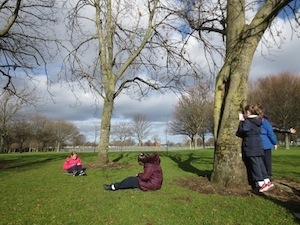 There are a variety of trees in the park. 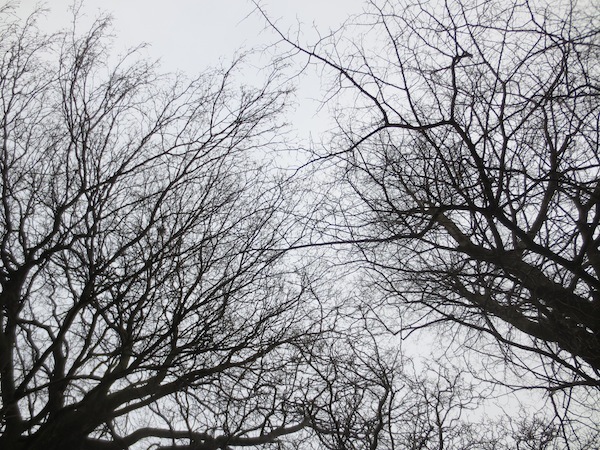 They were still leafless. 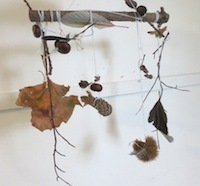 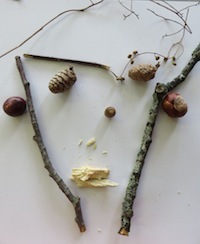 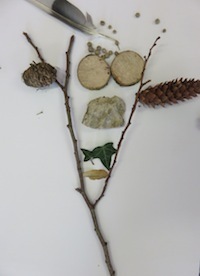 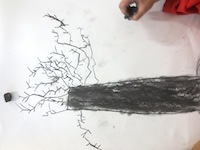 We discussed the patterns and shapes in the branches. 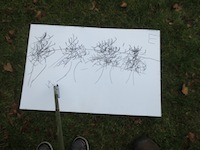 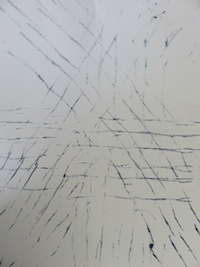 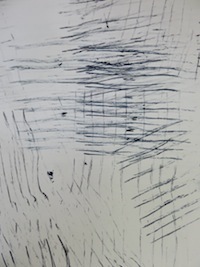 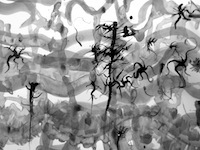 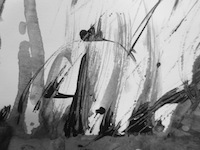 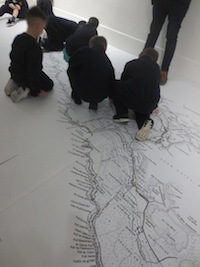 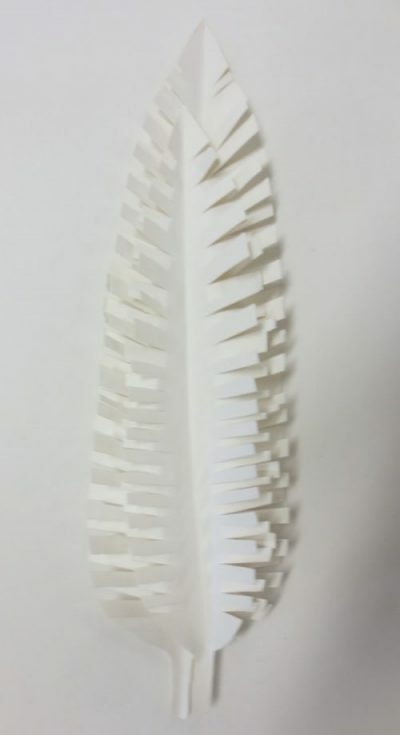 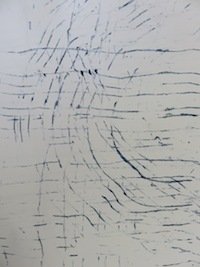 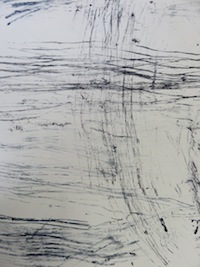 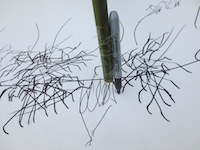 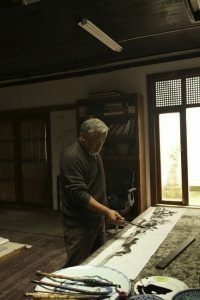 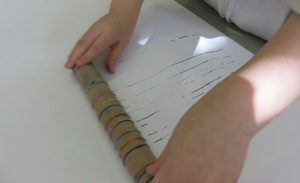 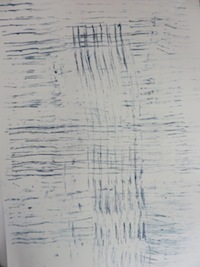 They made large drawings using pens tied to the end of sticks. 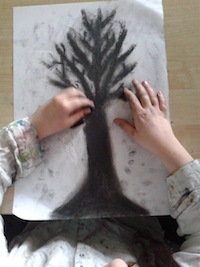 During the next session in school the children were introduced to charcoal. 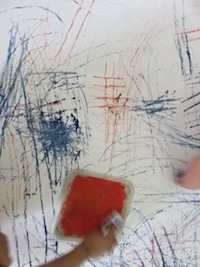 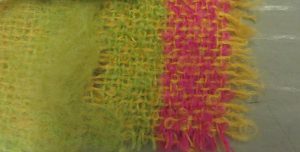 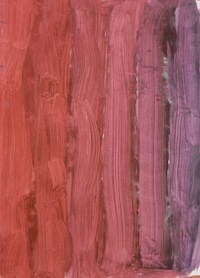 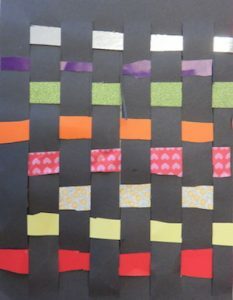 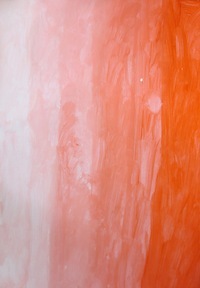 They spent time trying out different marks and tones. 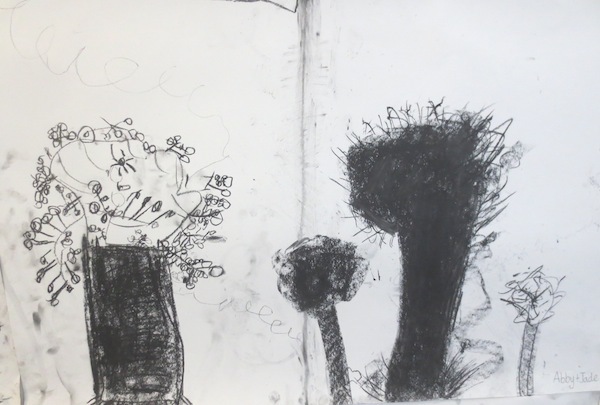 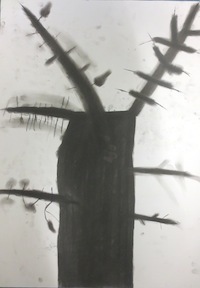 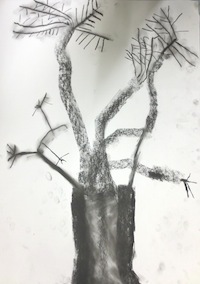 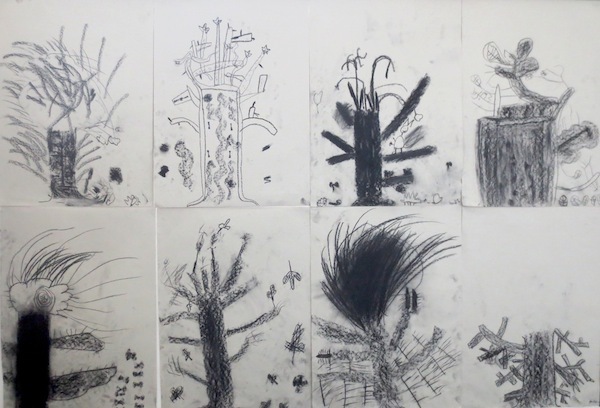 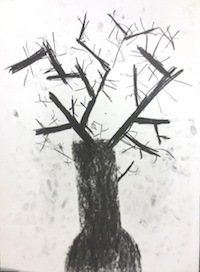 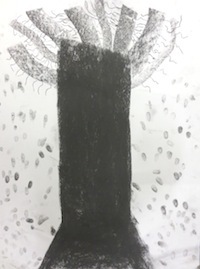 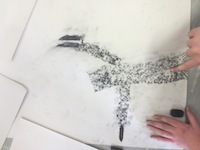 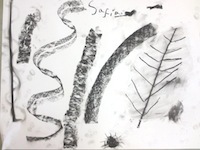 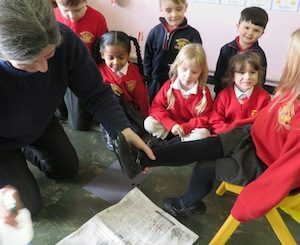 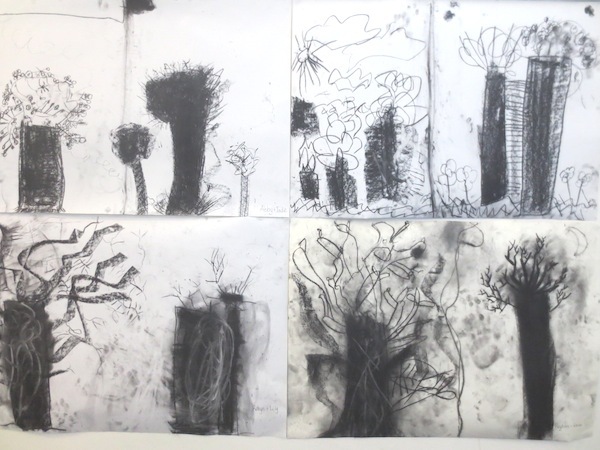 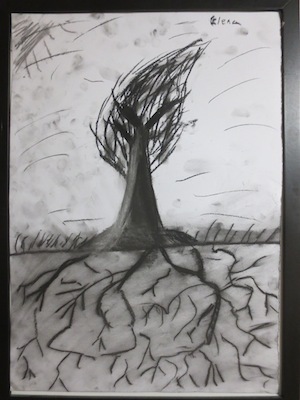 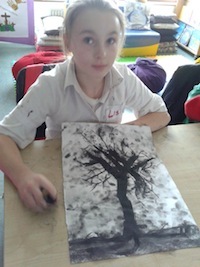 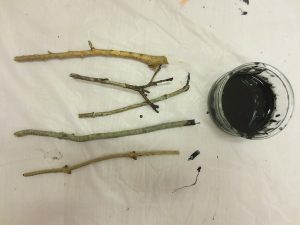 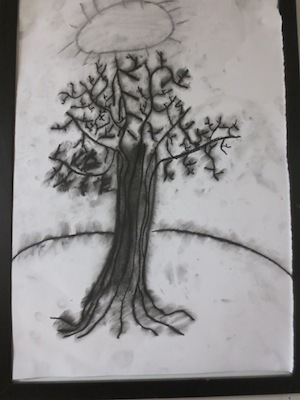 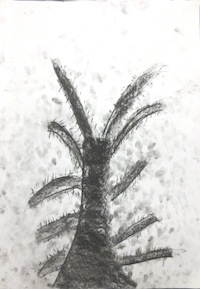 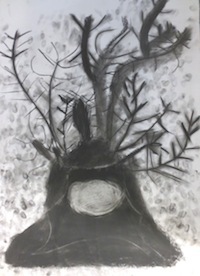 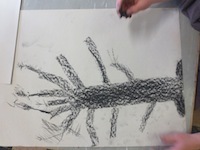 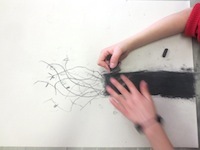 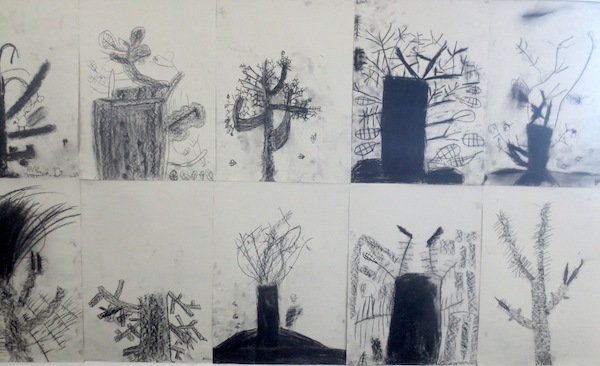 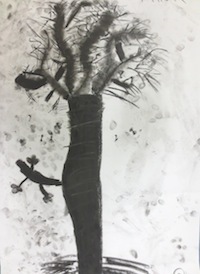 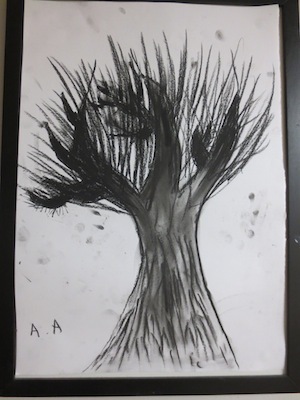 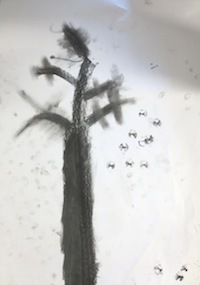 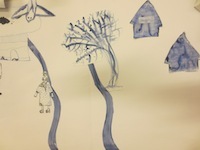 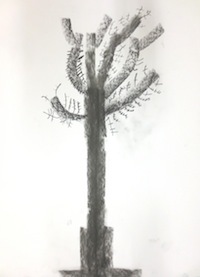 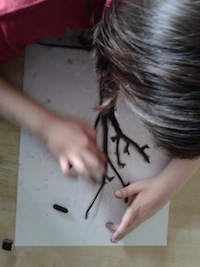 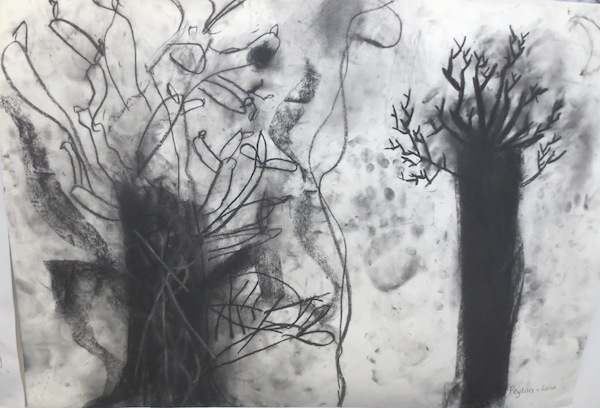 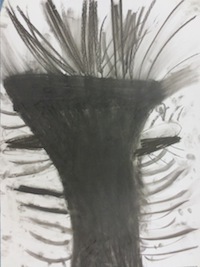 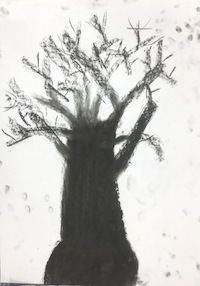 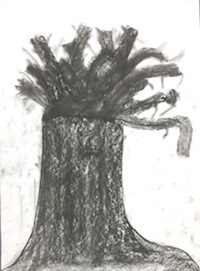 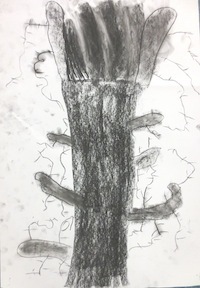 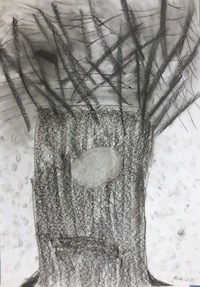 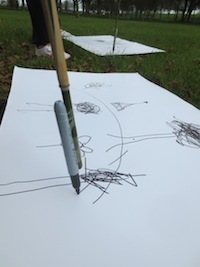 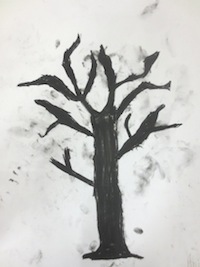 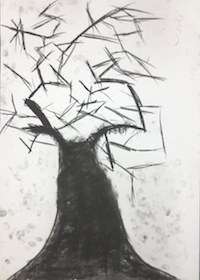 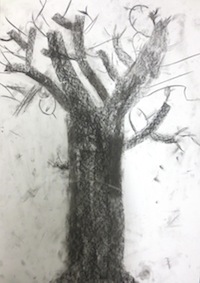 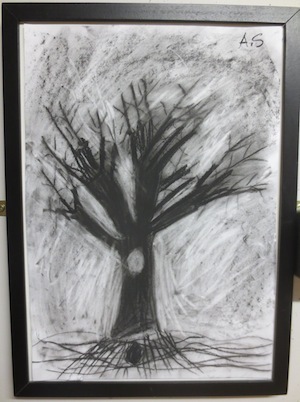 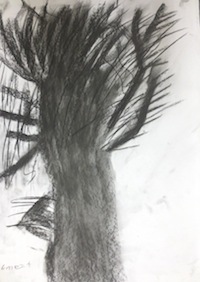 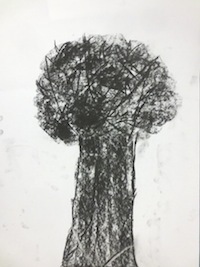 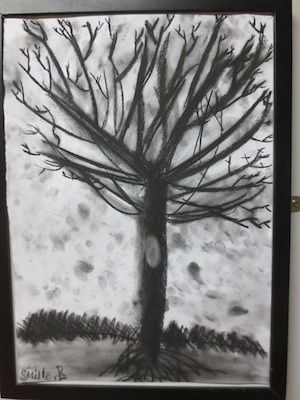 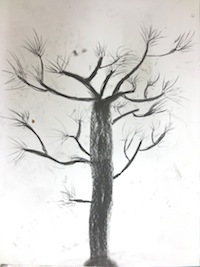 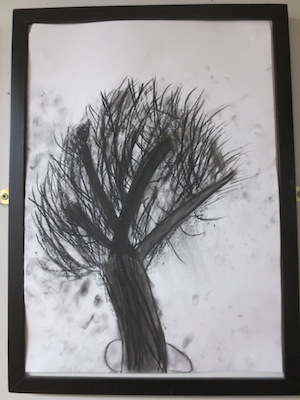 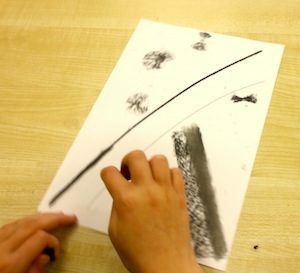 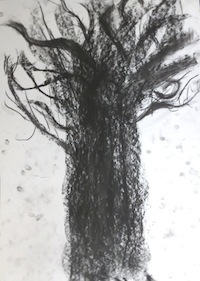 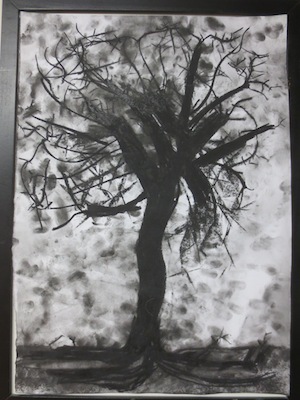 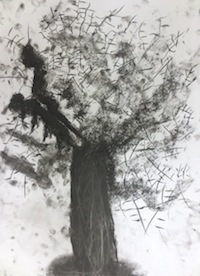 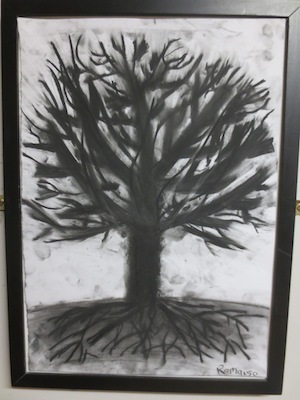 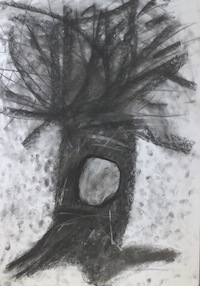 We looked at trees on the internet and then each child drew a tree in charcoal. 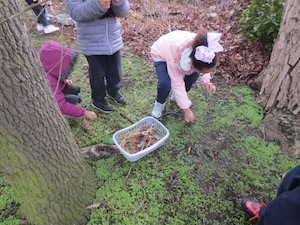 During these weeks signs of Spring were beginning to arrive. 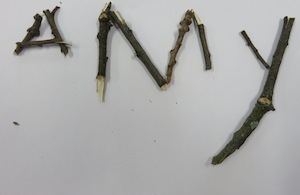 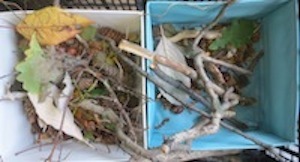 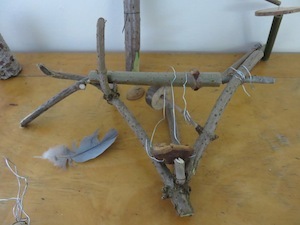 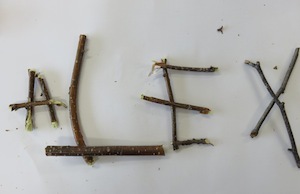 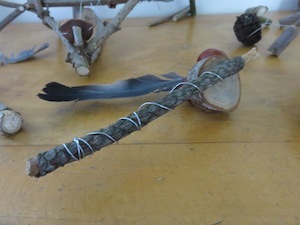 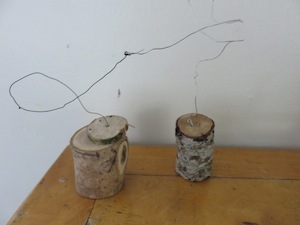 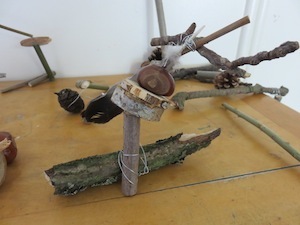 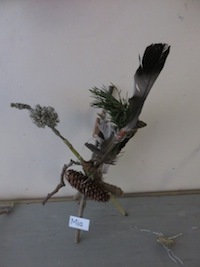 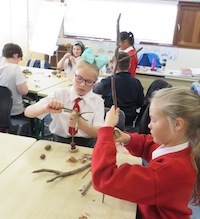 Birds were gathering twigs in the school grounds for nesting although the trees were still bare. 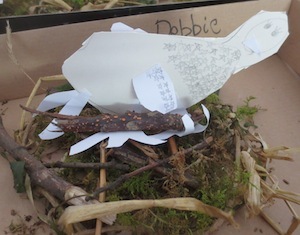 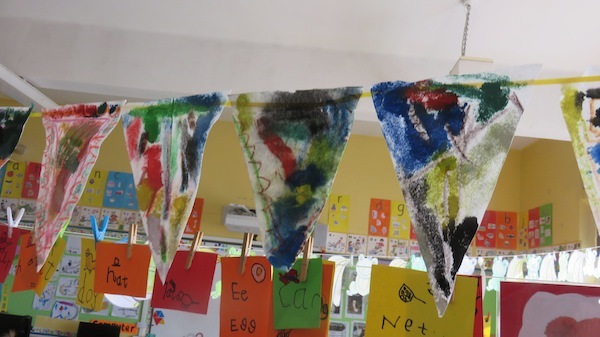 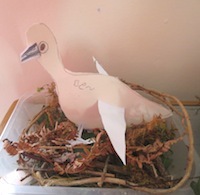 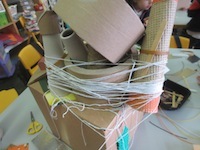 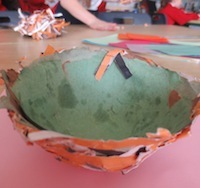 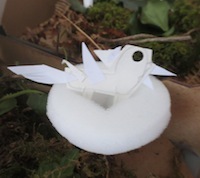 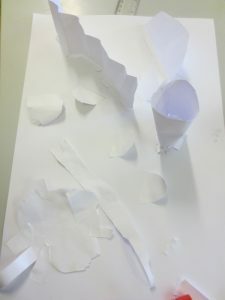 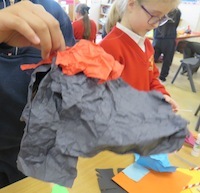 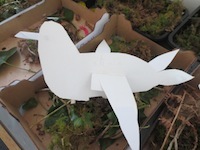 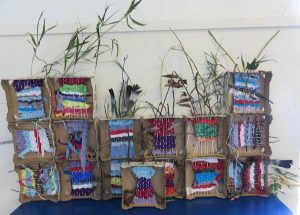 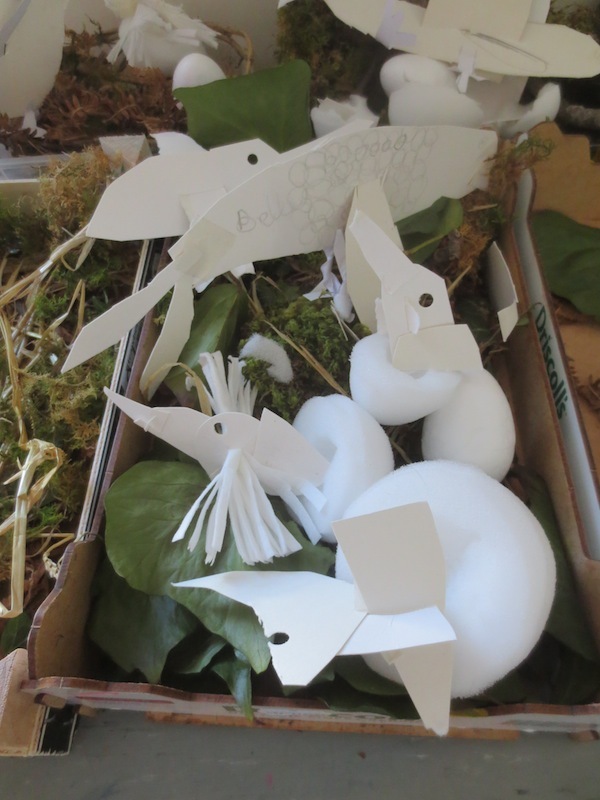 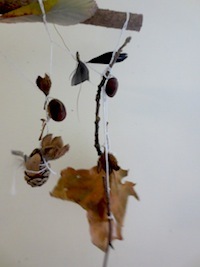 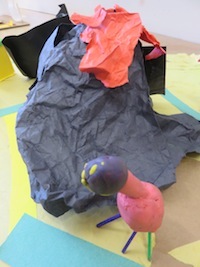 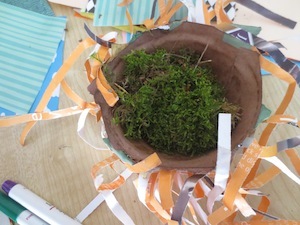 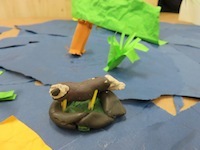 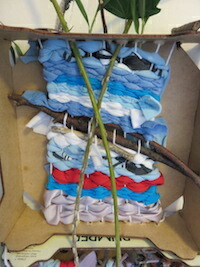 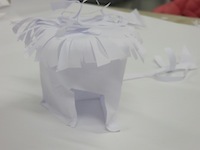 The children made papier mache nests. 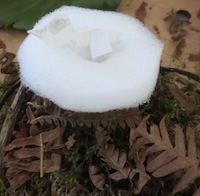 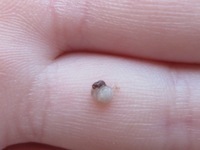 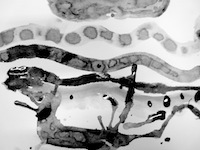 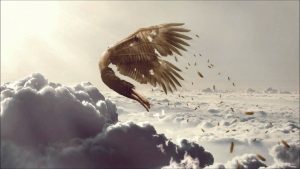 The following week the nests were dry. 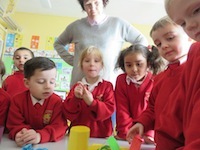 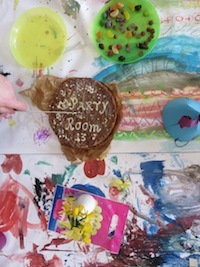 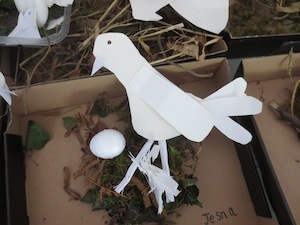 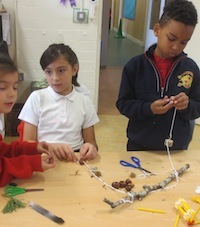 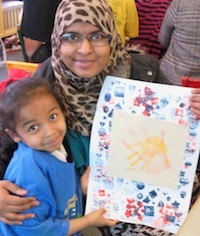 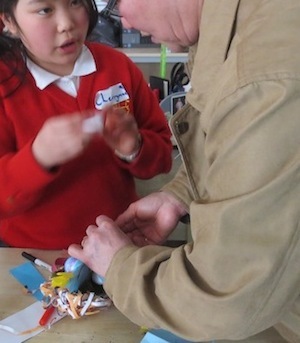 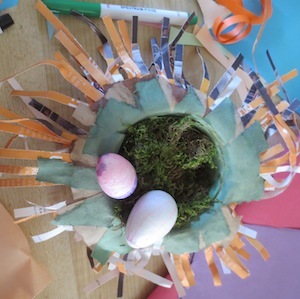 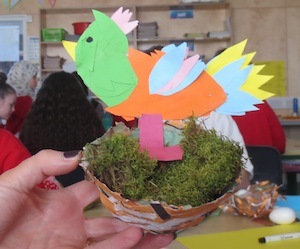 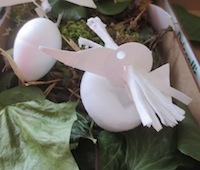 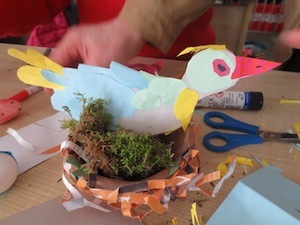 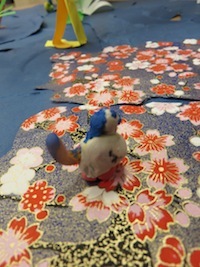 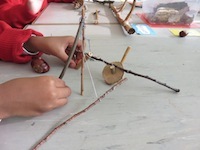 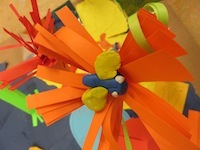 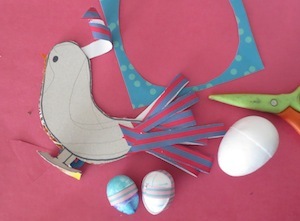 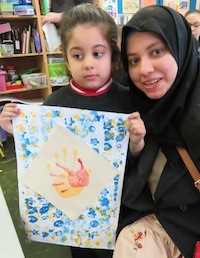 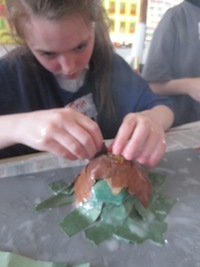 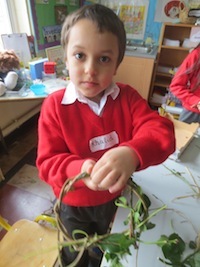 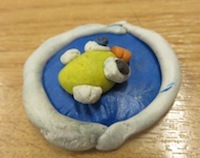 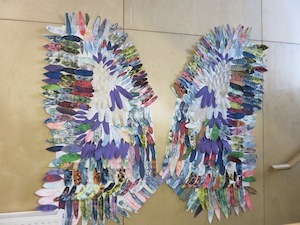 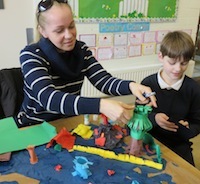 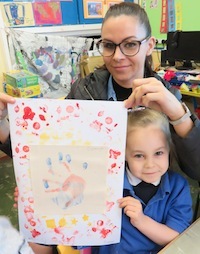 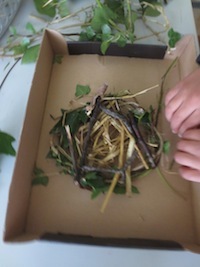 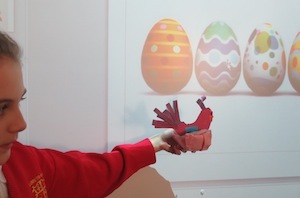 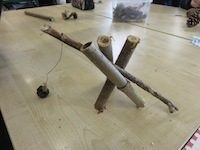 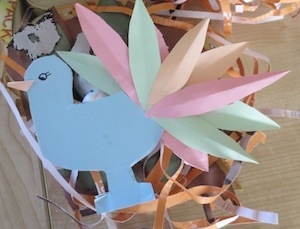 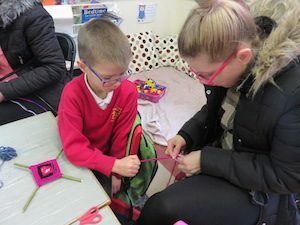 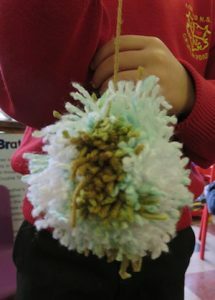 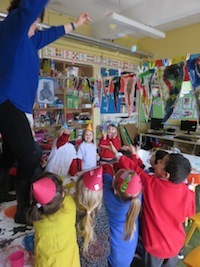 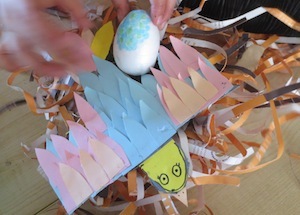 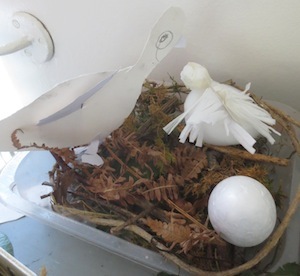 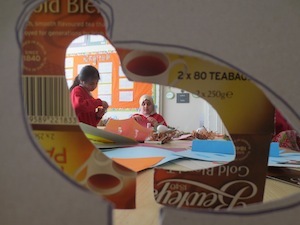 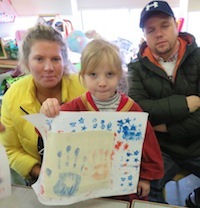 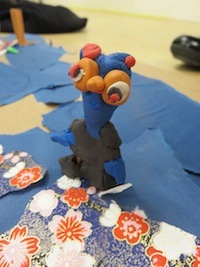 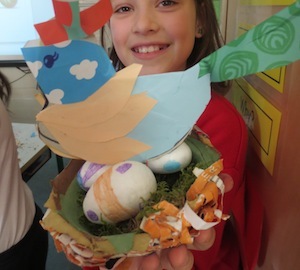 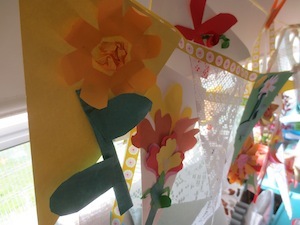 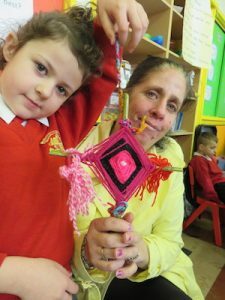 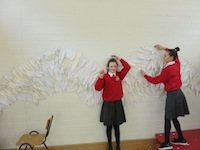 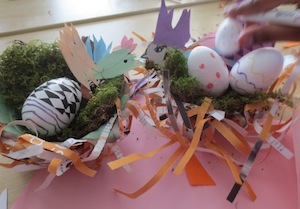 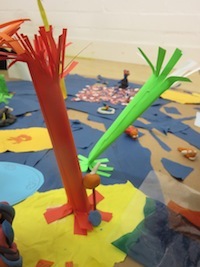 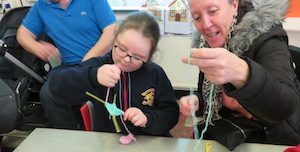 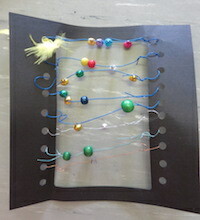 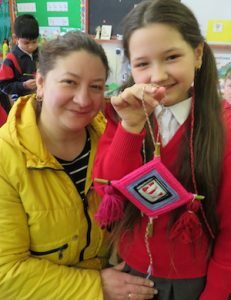 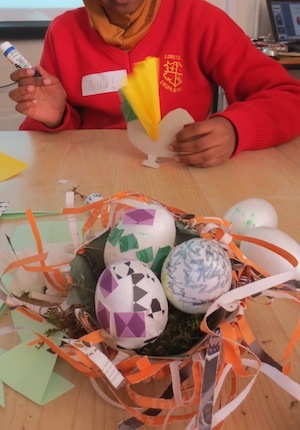 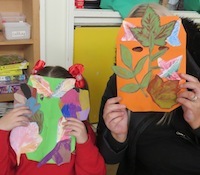 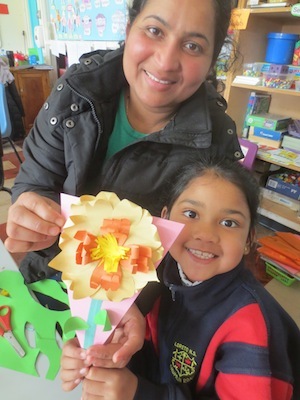 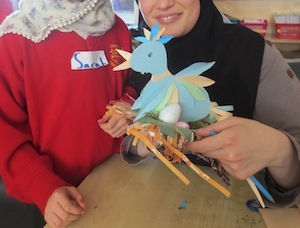 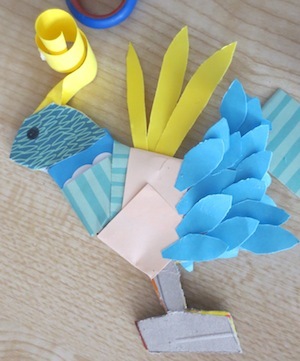 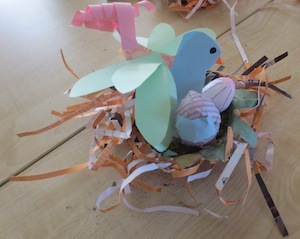 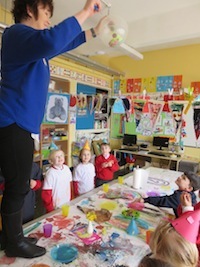 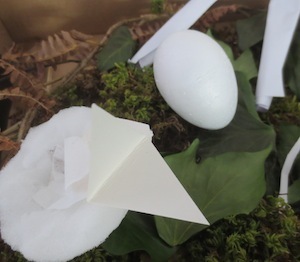 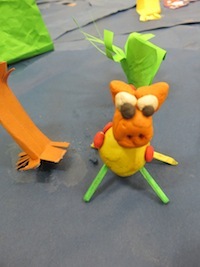 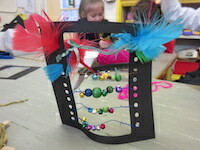 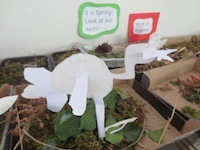 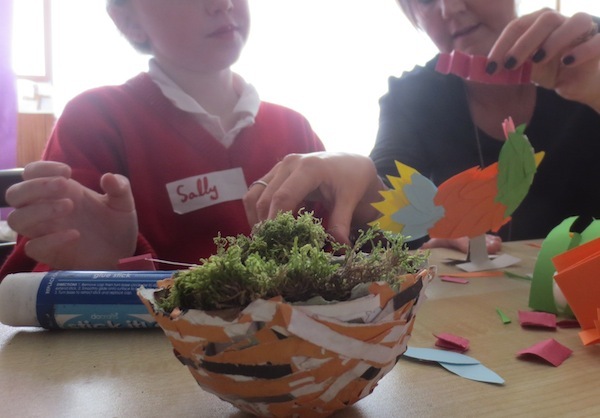 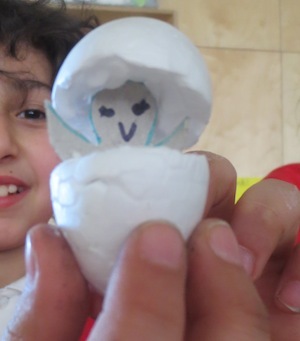 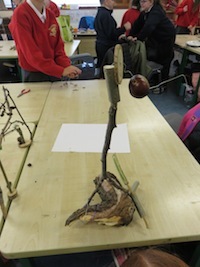 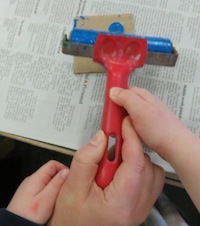 This was the final session so parents were invited in to work with their children to make birds and eggs for the nests. 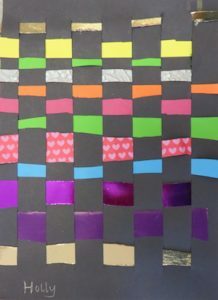 They used collage and markers. 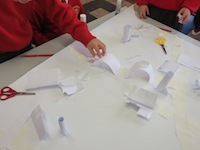 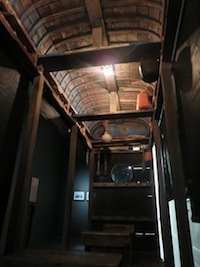 There was a lovely atmosphere of working together.